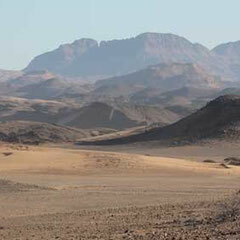 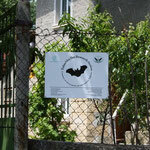 Field work of our group in various parts of the world - batlabs Jimdo-Page! 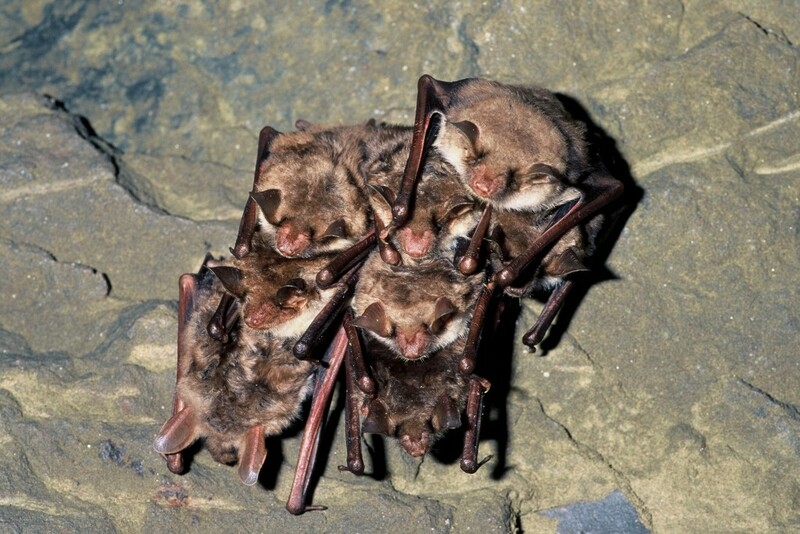 Bats from top left to low right: Greater mouse-eared bat, brown long-eared bat, grey long-eared bat, Leisler's bat, roost of long-eared bat, Bechstein's bat. 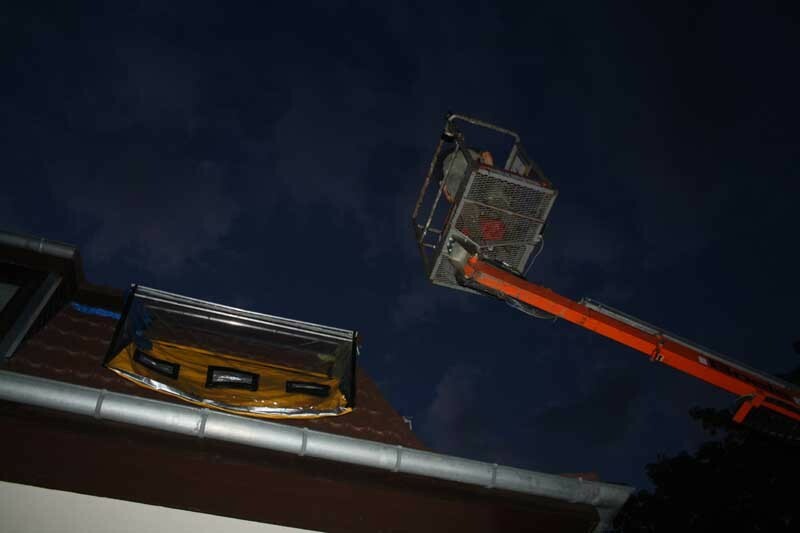 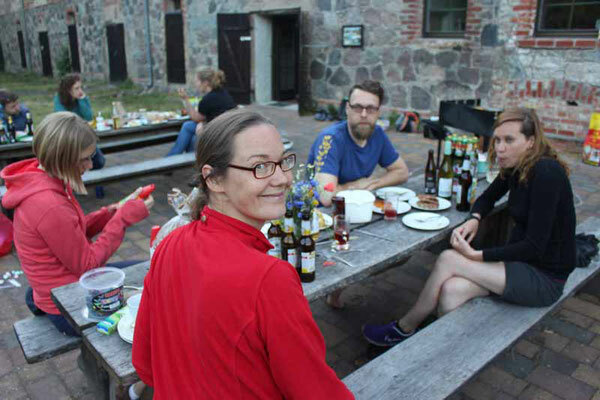 BBQ and emergence count at bat museum Julianenhof: We counted a total of almost 1300 bats, including Myotis brandti, Pipistrellus pipistrellus, P. pygmaeus and P. nathusii, the highest count of bats in that roost since its protection. 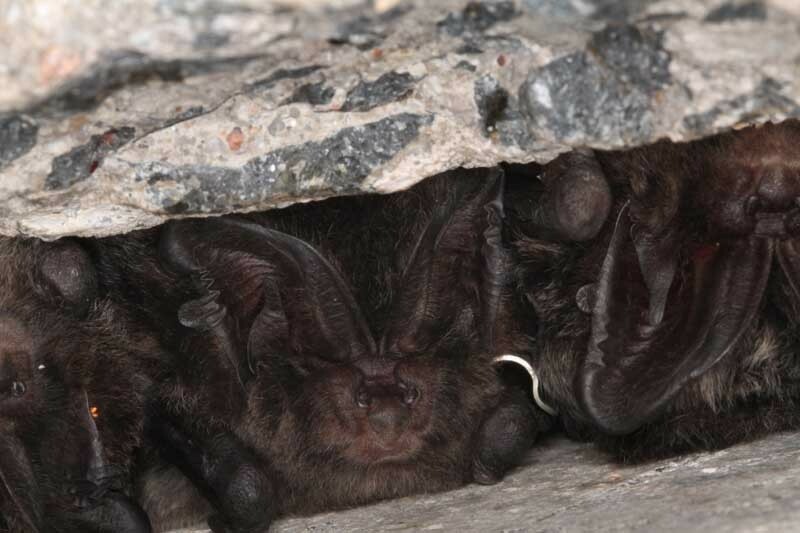 Field work in Latvia: Pipistrellus nathusii (top left), albinotic P. pygmaeus (top right), Pipistrellus pygmaeus (bottom left), Myotis dasycneme (bottom right). 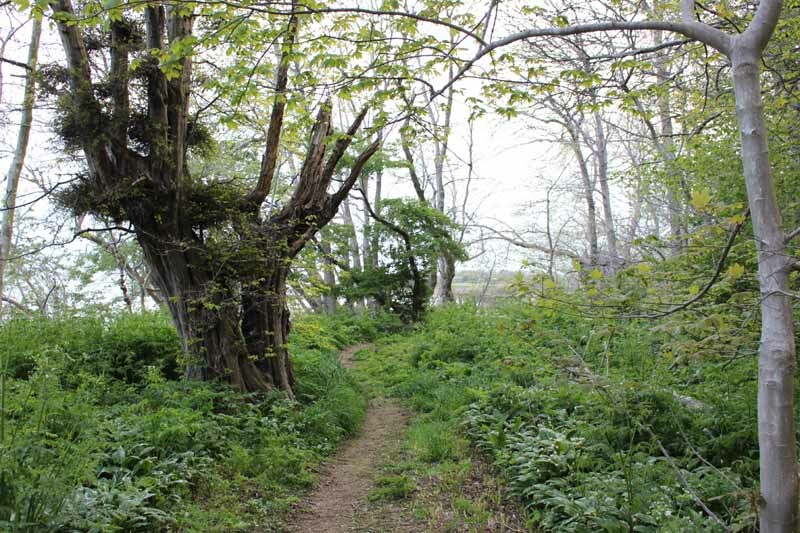 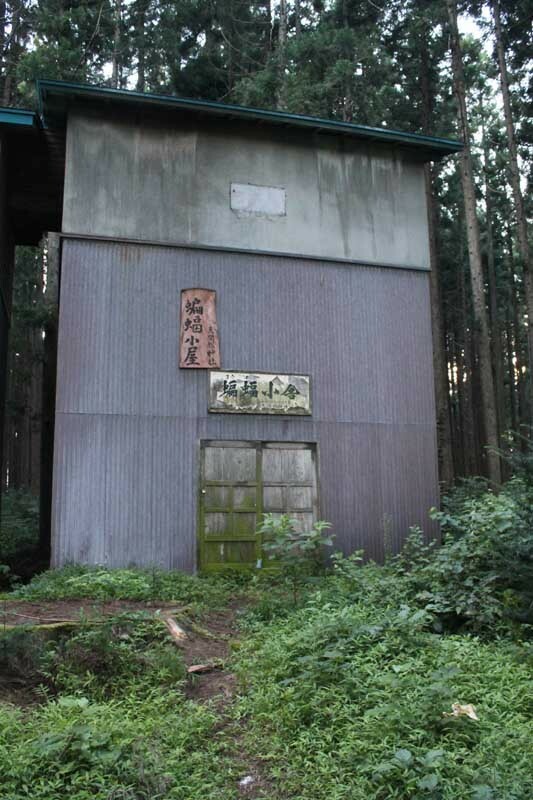 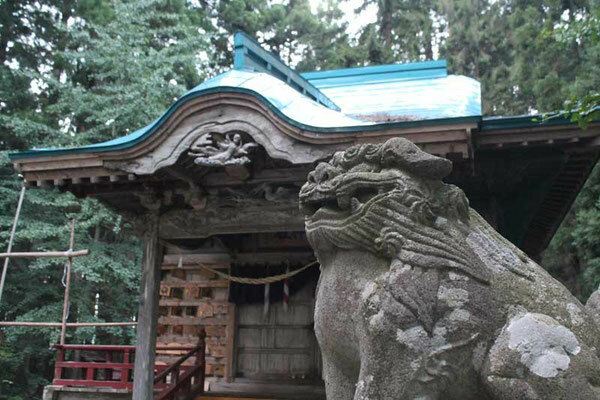 Shintu shrine on Honshu island: This shrine was occupied by Vespertilio superans until the late eighties when local people decided to remove the bats. 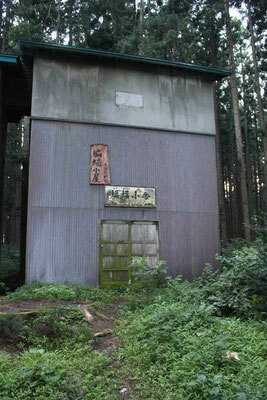 In 1977, they built an adjacent house (lower left picture) that serves as an alternative roost since then. 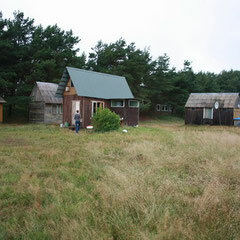 Another building was added in 2003 (top right picture). 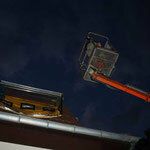 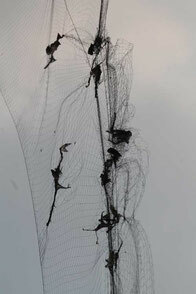 This seems to be one of the first attempts worldwide to translocate a whole colony to another building. 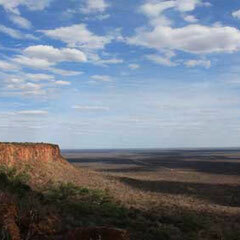 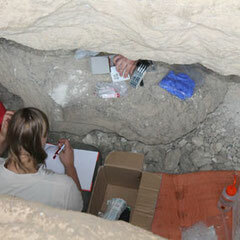 Currently, the colony counts about 2,700 individuals. 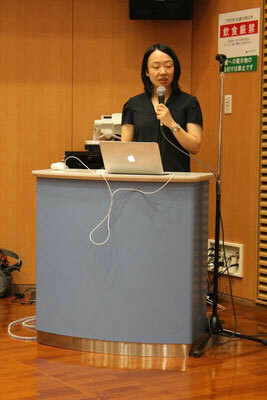 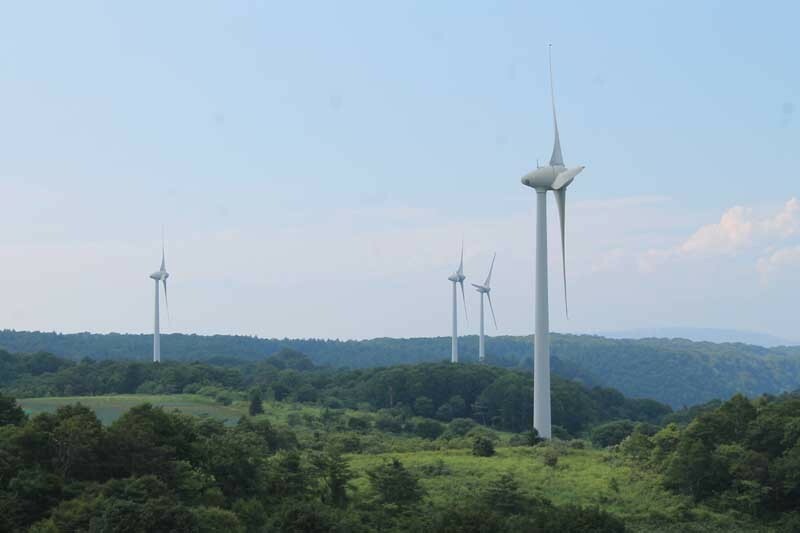 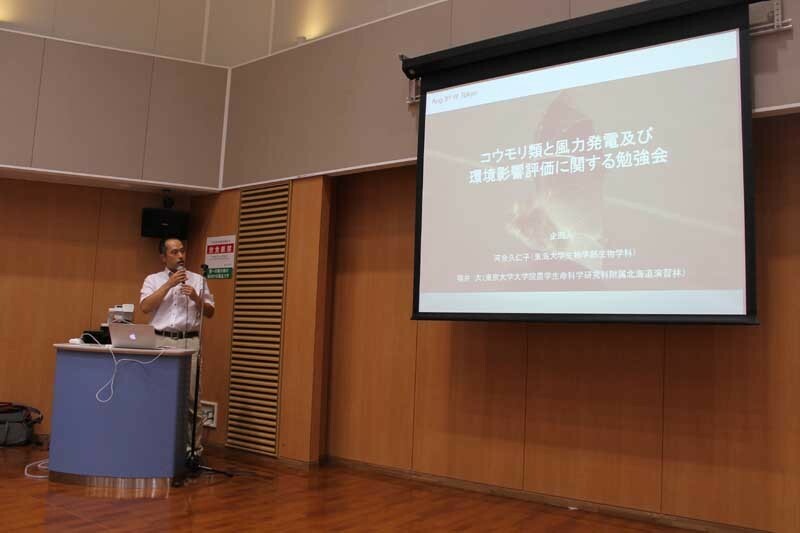 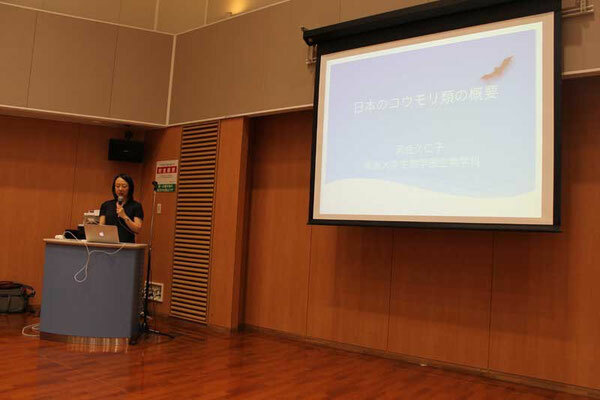 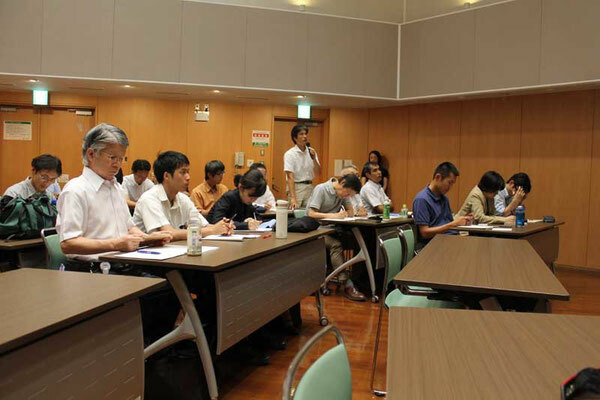 One day conference in Tokyo about wind energy development and bat fatalities in Japan with members of the ministry of environment, wildlife societies and consultants participating. 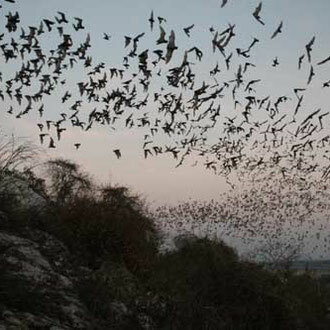 Flying foxes, such as Rousettus leschenaultii, are threatened by direct persection. 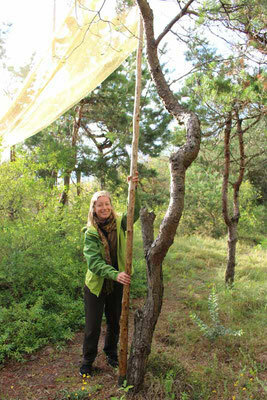 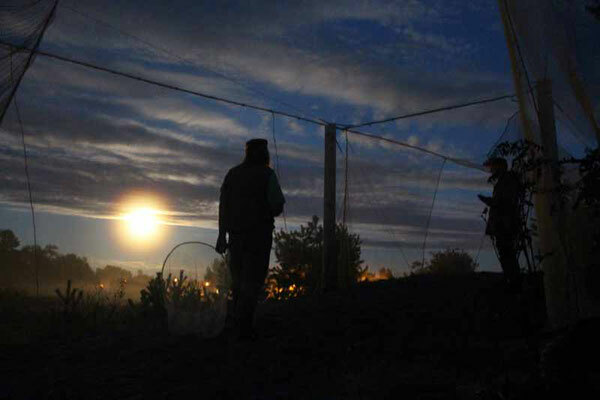 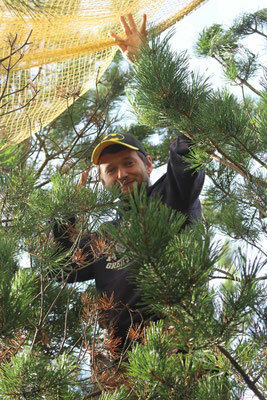 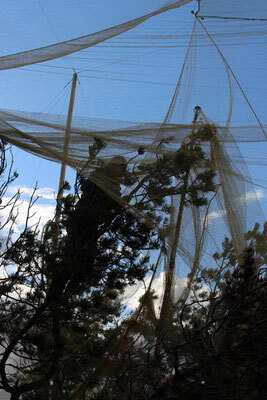 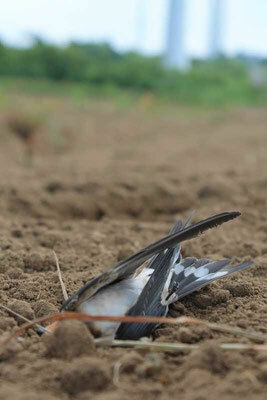 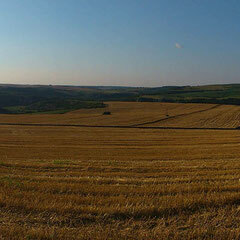 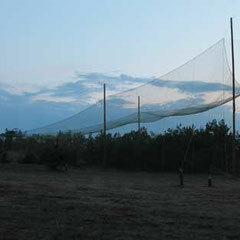 Often, farmers try to protect their orchards by putting up mistnets. 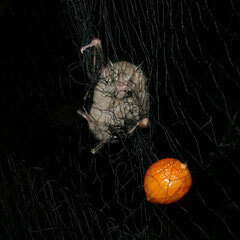 Yet, bats only consume ripe or overripe fruits that are not suitable for the market and bats are awfully killed by letting them starve and overheat until death. 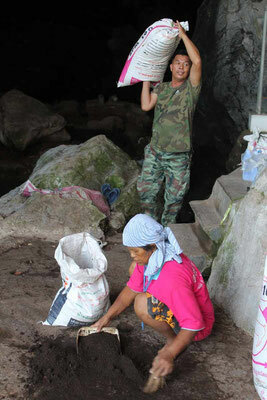 We hope that this practice will soon stop in Southeast Asia. 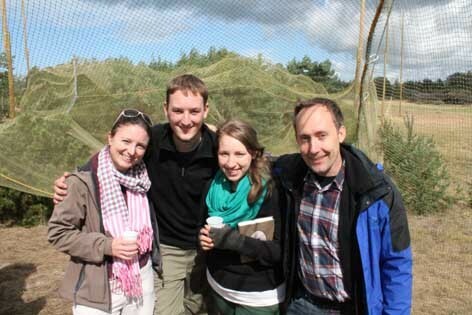 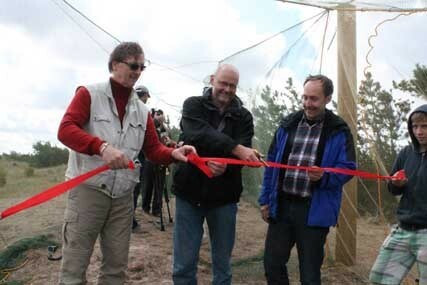 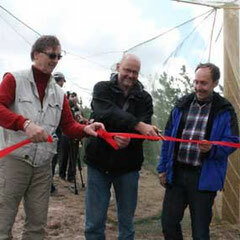 August 2014, Pape, Latvia: The inauguration of the newly constructed funnel trap: The director of the Berlin-based Leibniz Institute for Zoo and Wildlife Research (IZW), Prof. Heribert Hofer, and the two leading principal investigators, Prof. Gunars Petersons from the Agricultural University of Latvia, and PD Dr. Christian Voigt from the IZW, opening the funnel trap on 19th of August 2014. 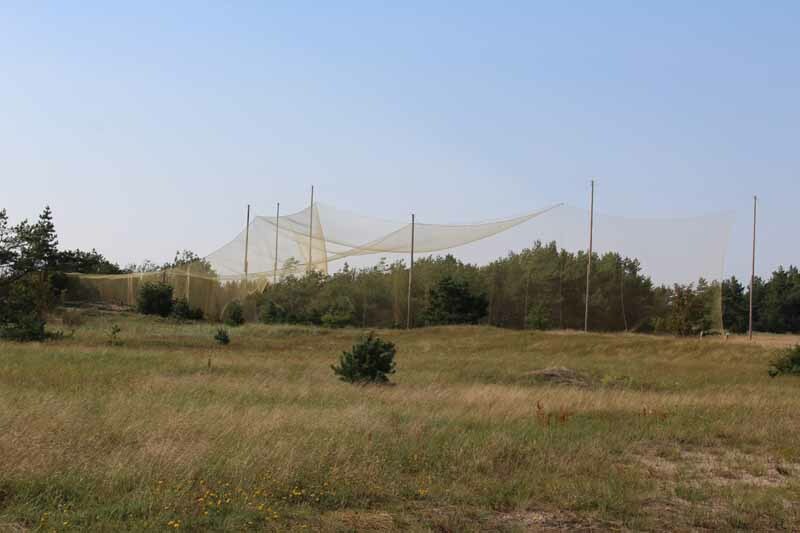 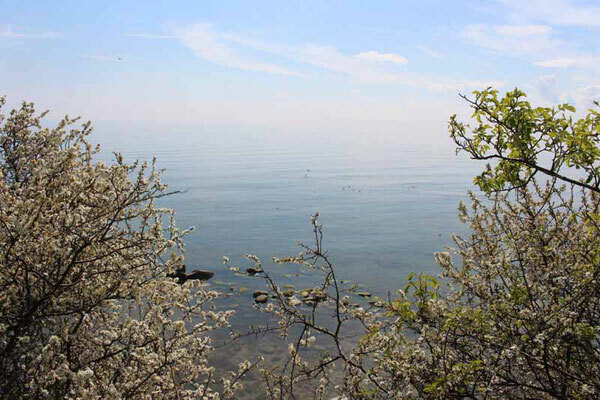 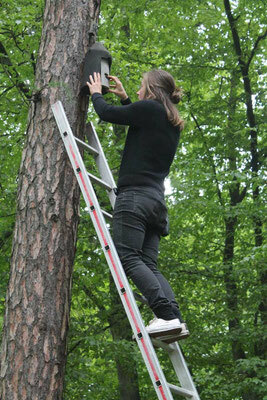 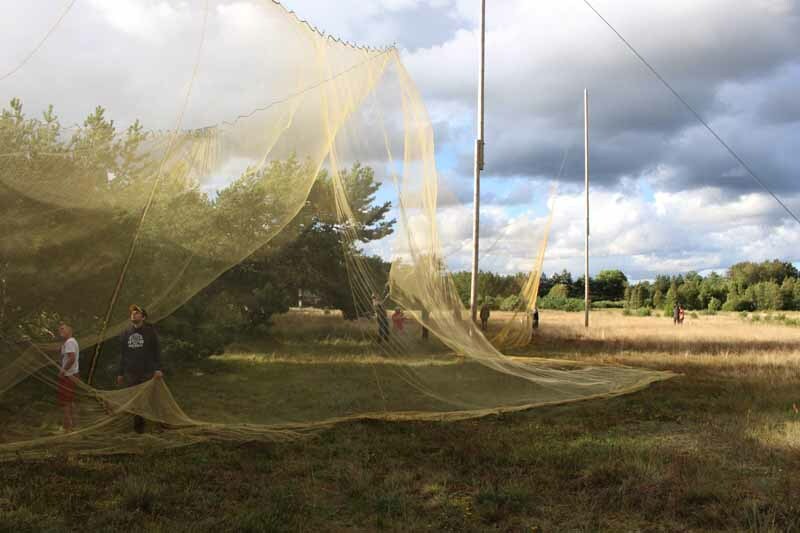 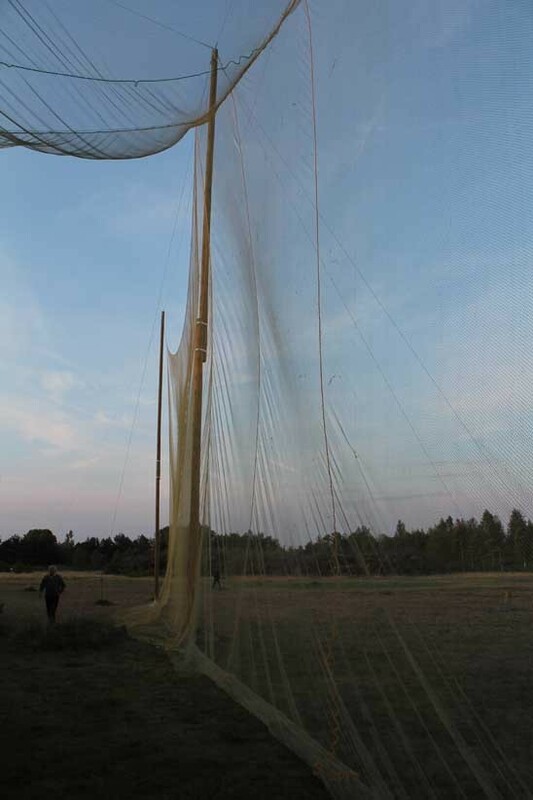 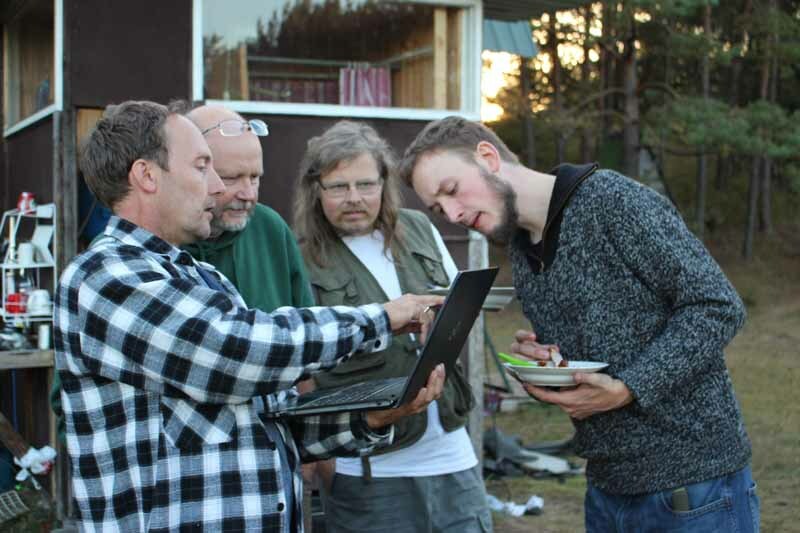 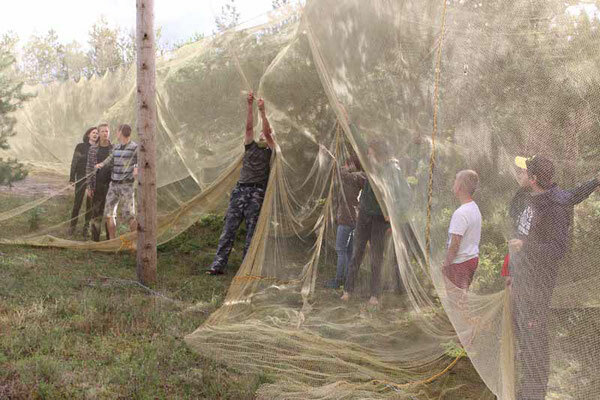 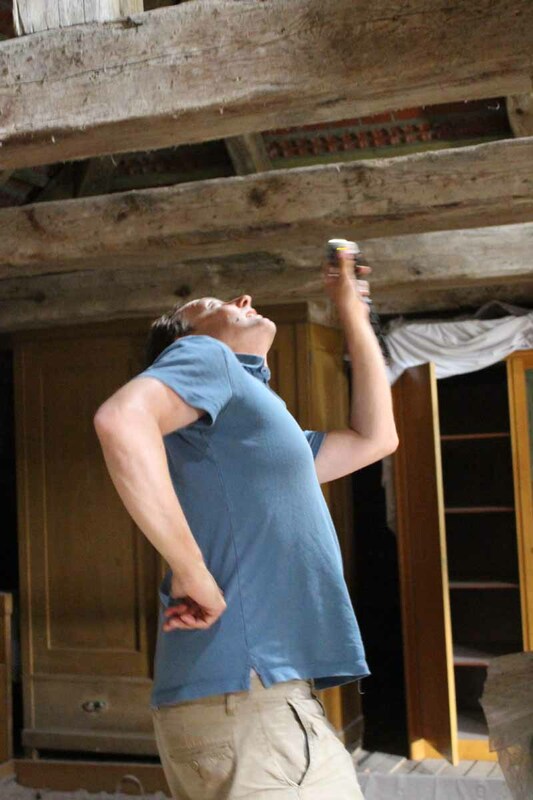 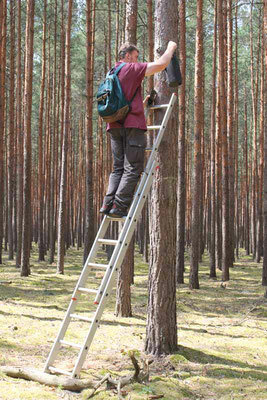 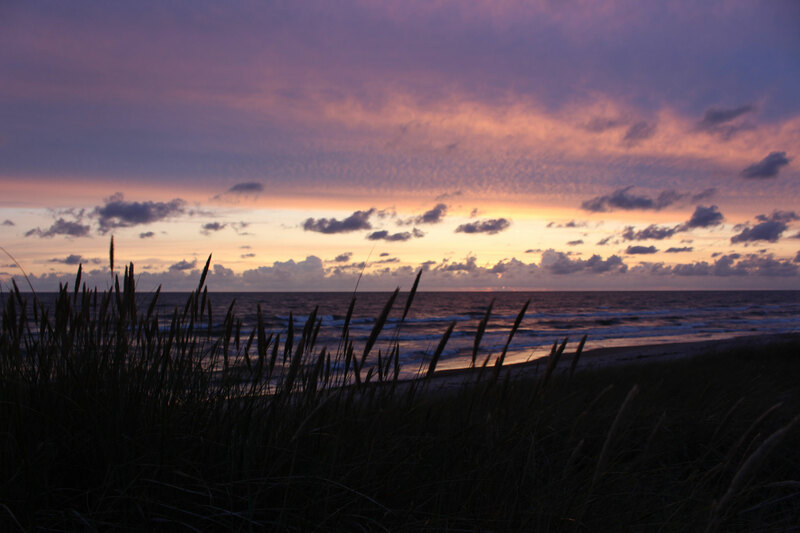 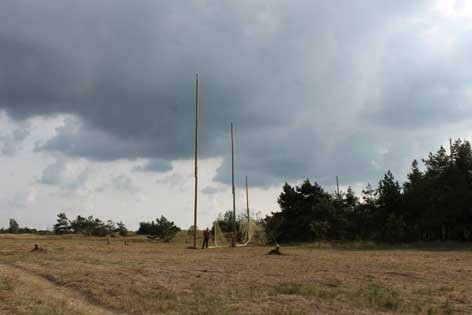 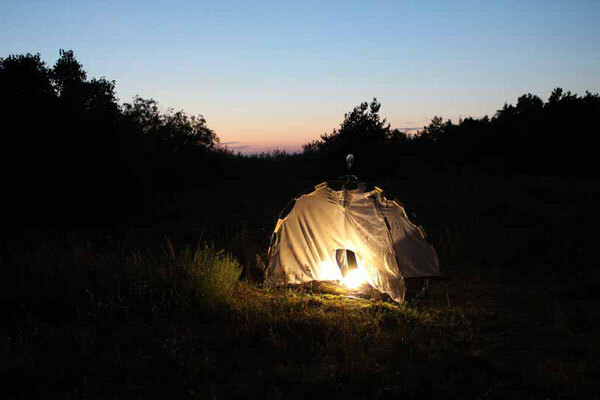 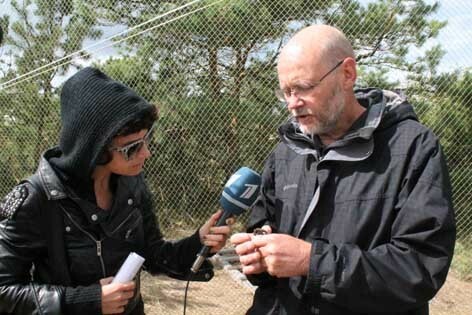 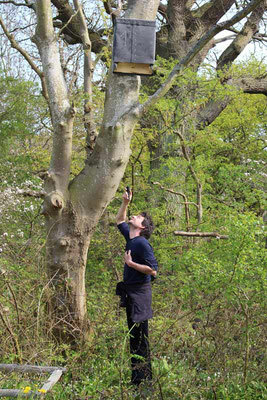 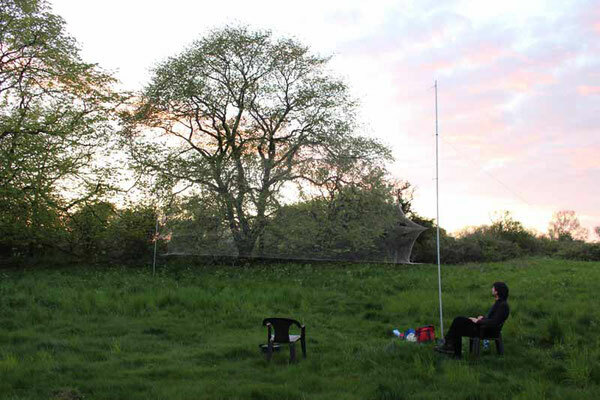 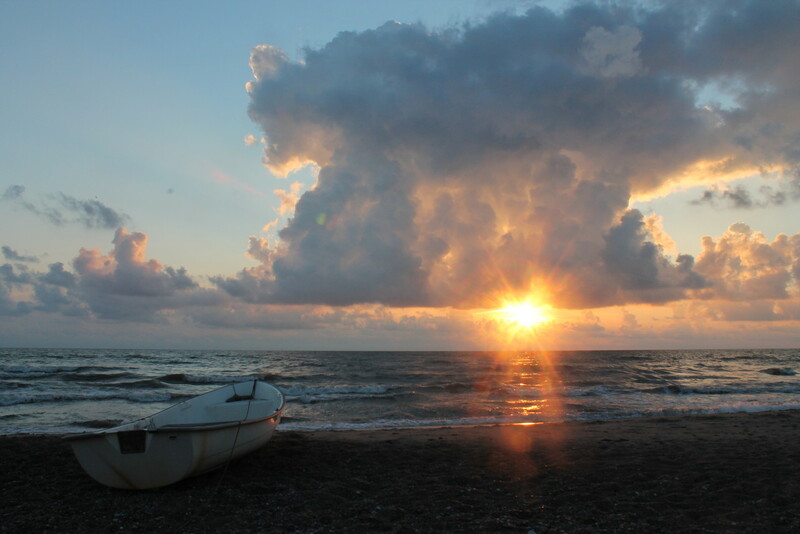 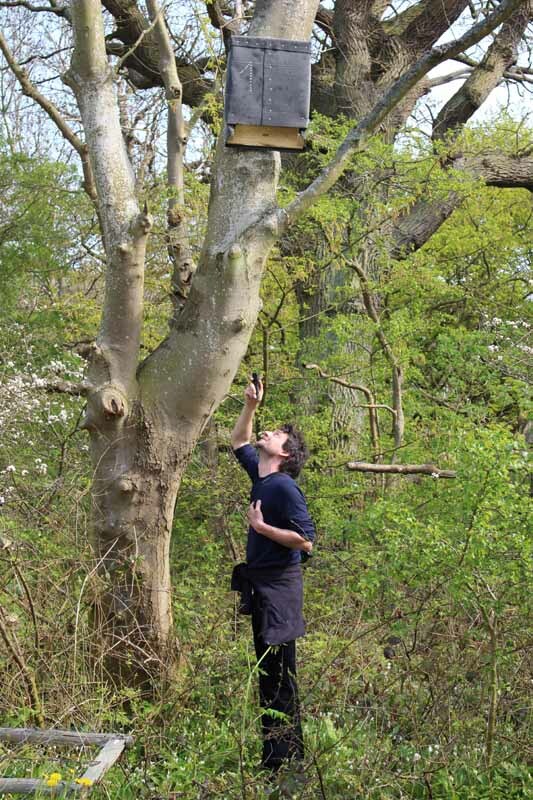 The new funnel trap of Pape Bat Ringing Station in action: The new funnel trap is designed to capture large numbers of migratory bats when they fly along the shores of the Baltic Sea southwards. 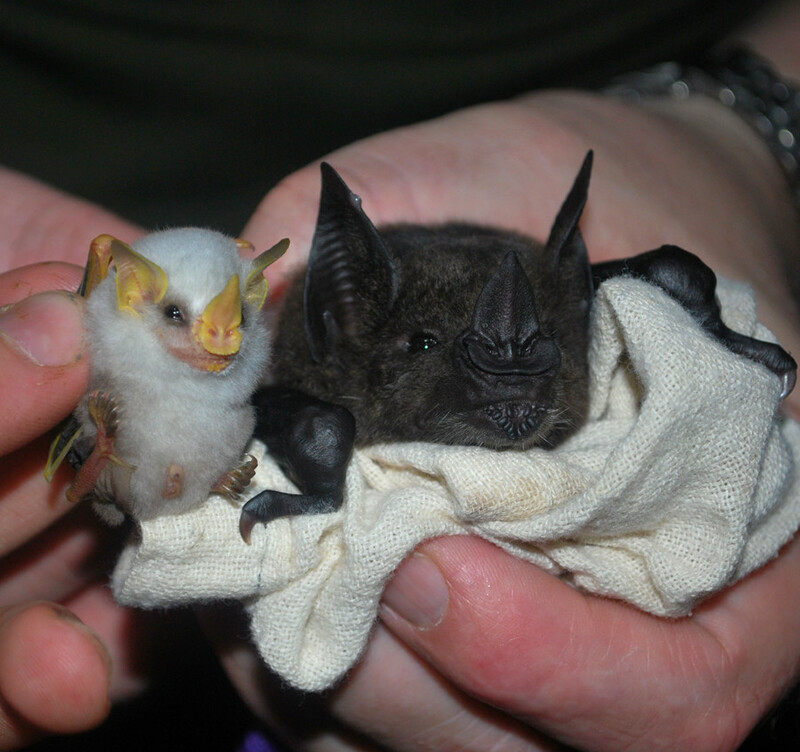 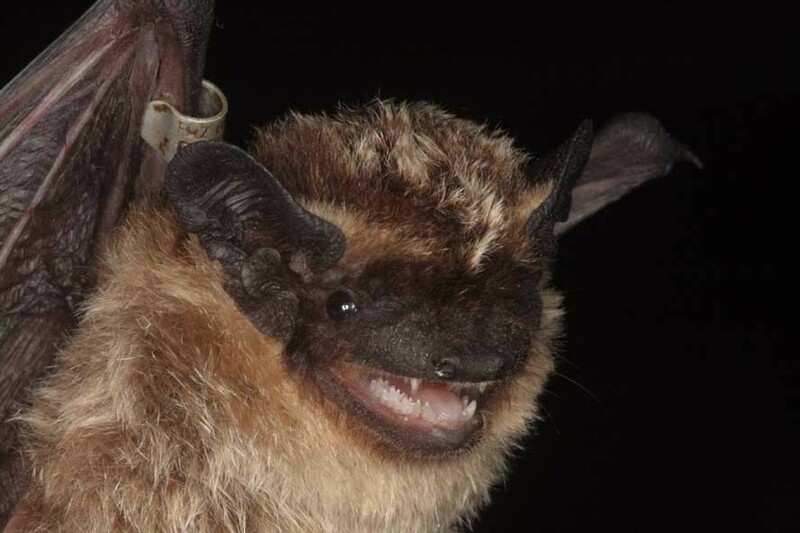 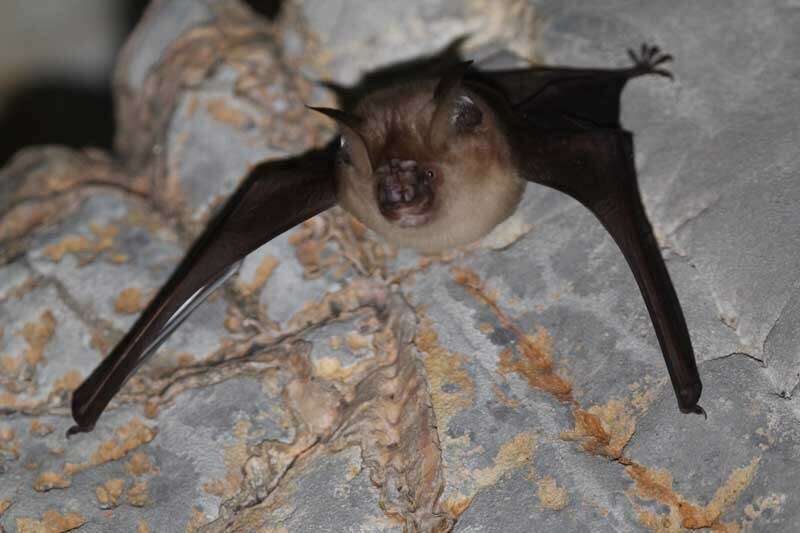 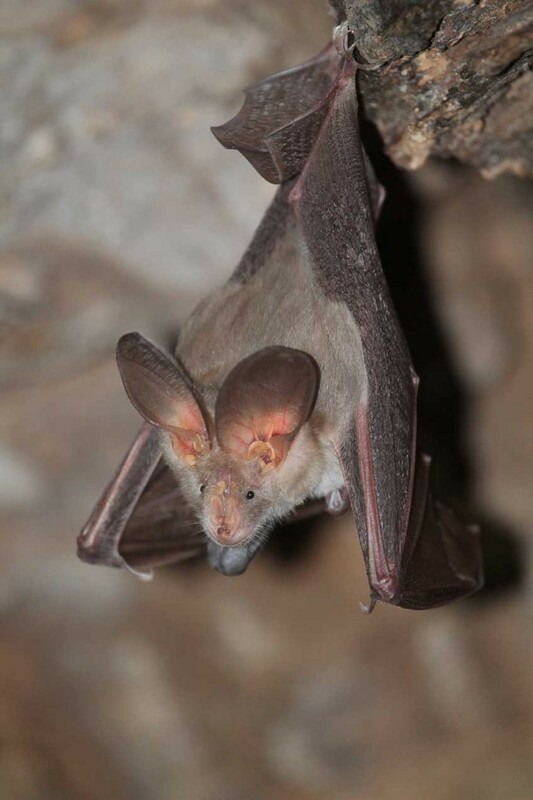 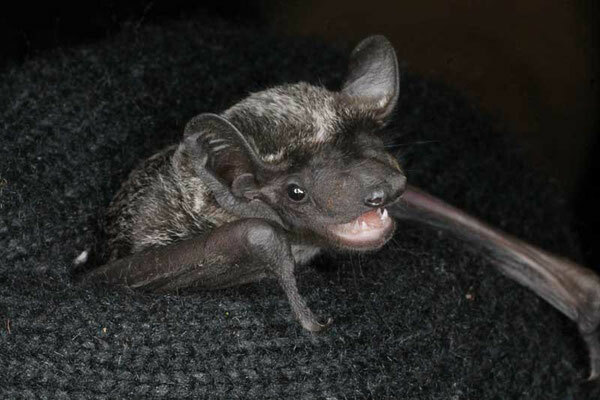 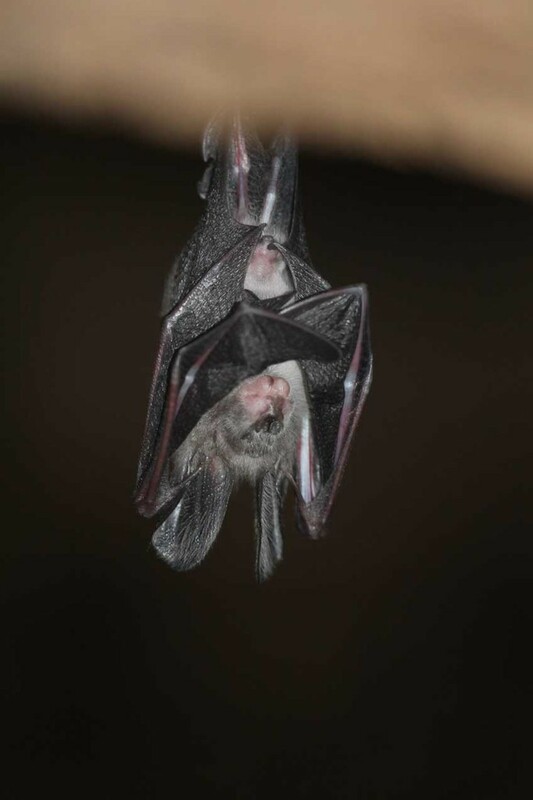 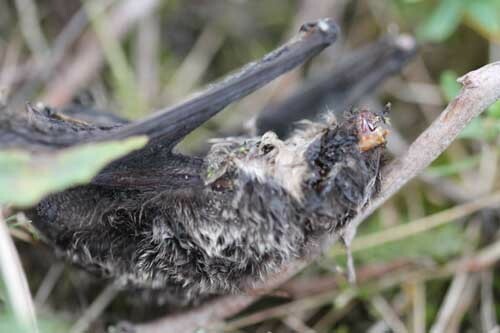 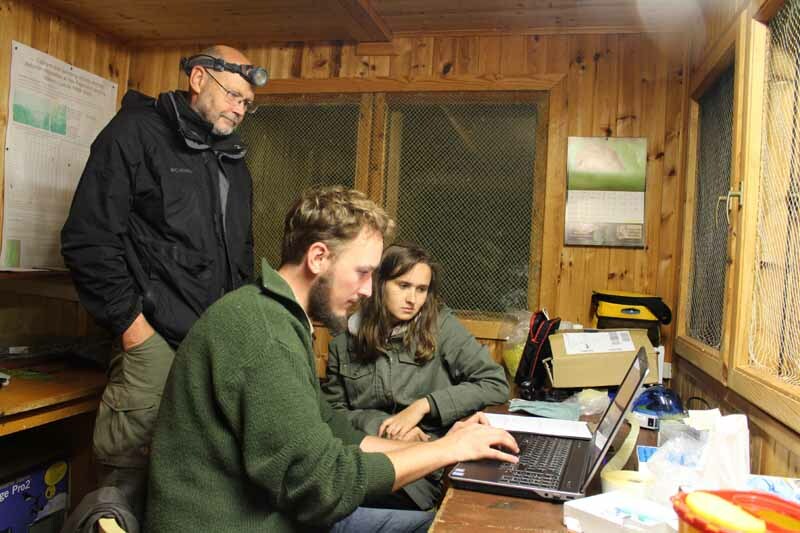 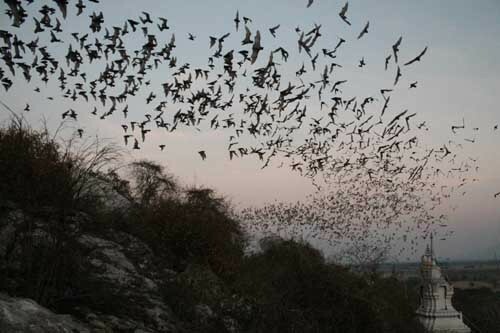 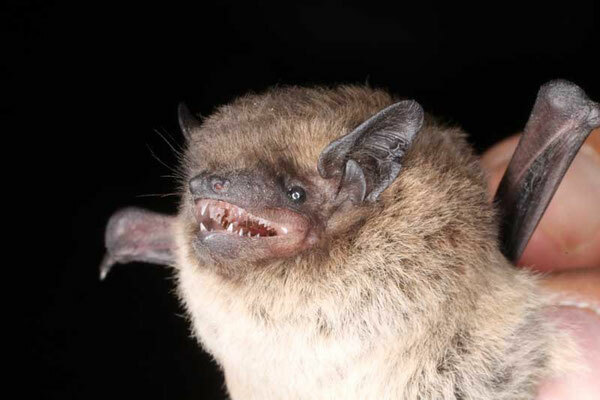 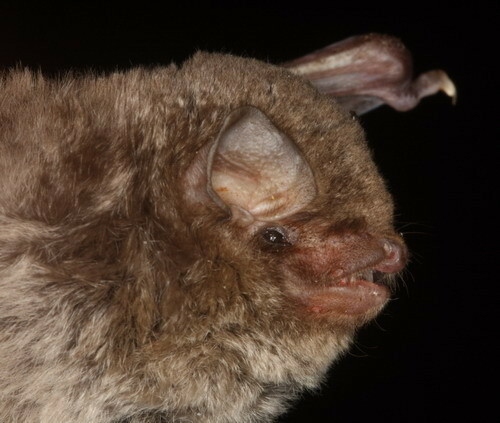 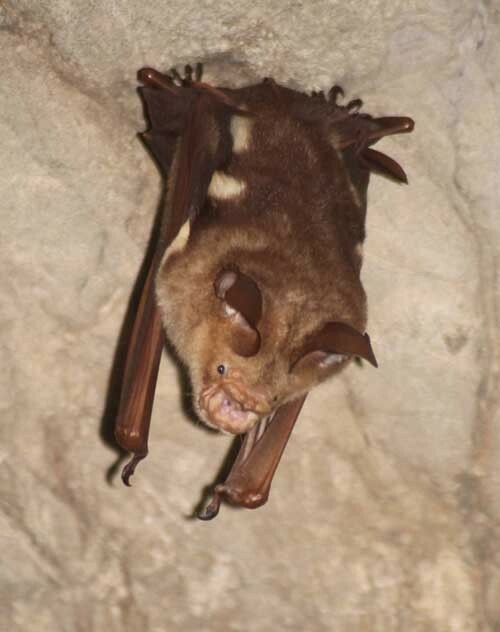 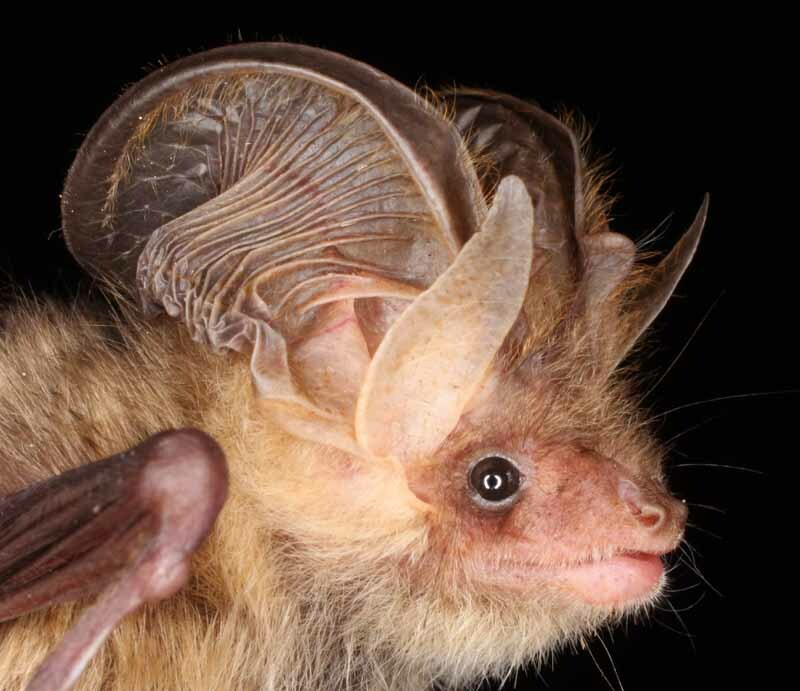 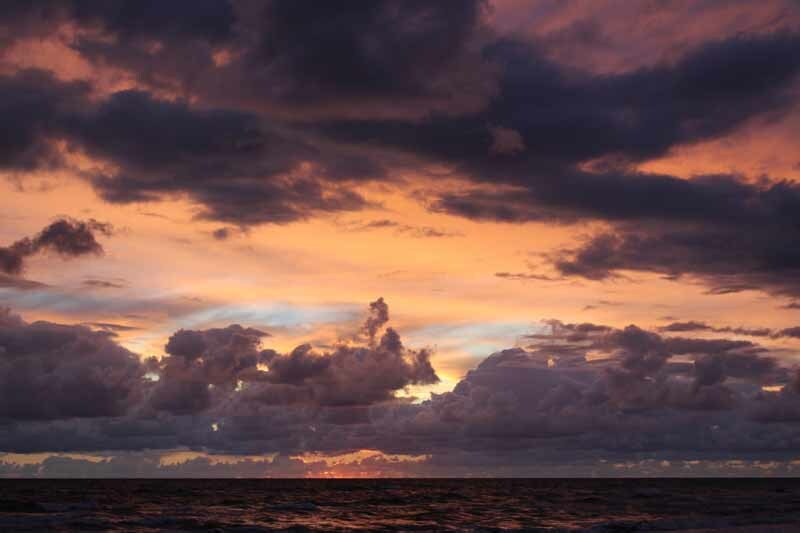 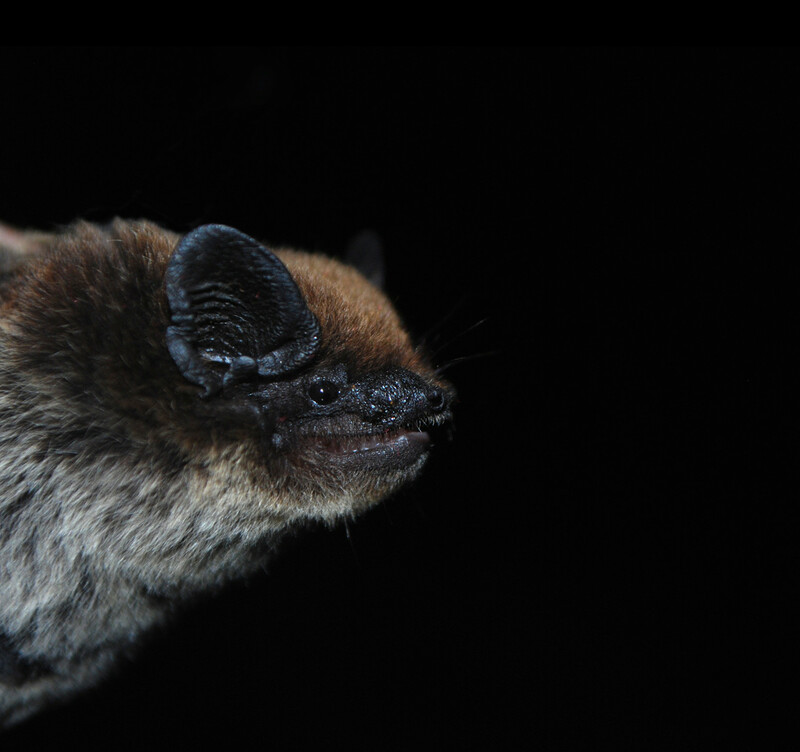 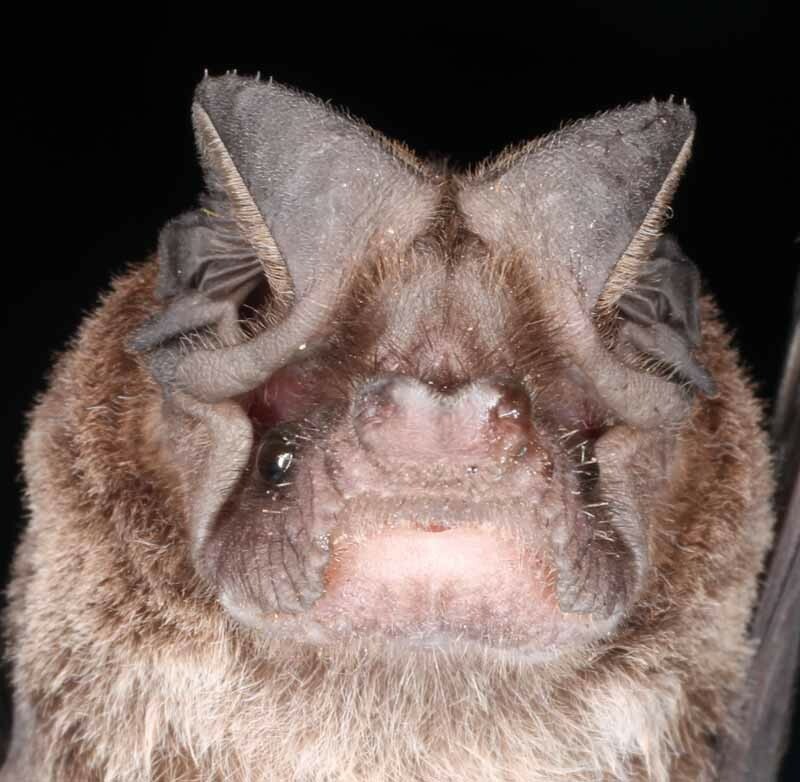 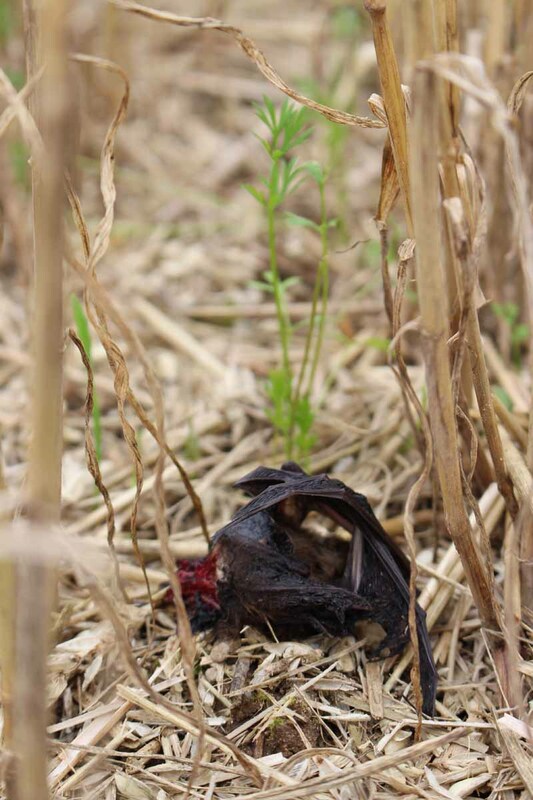 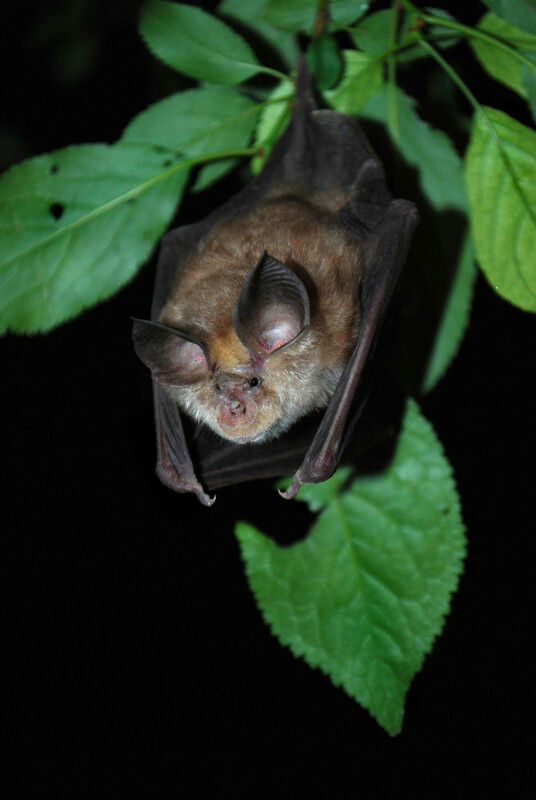 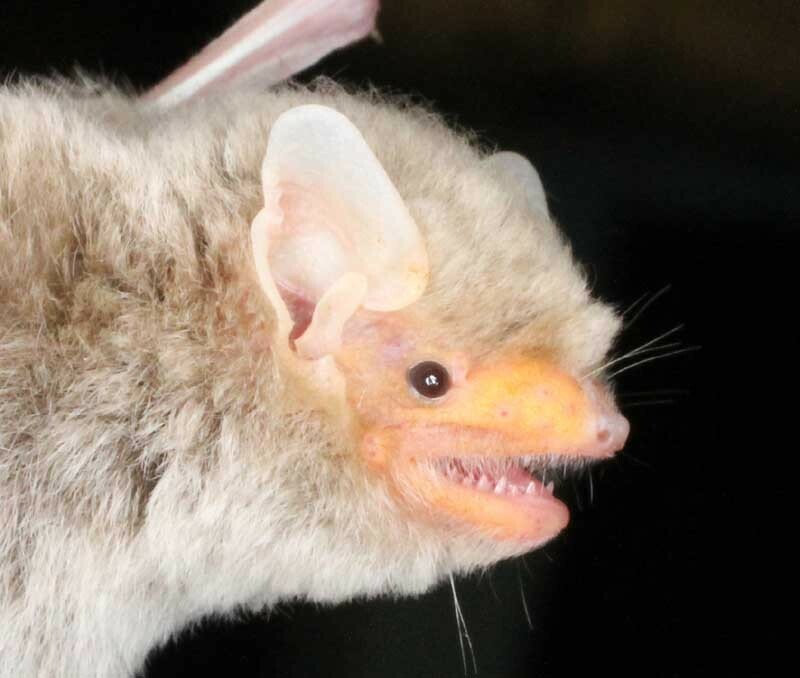 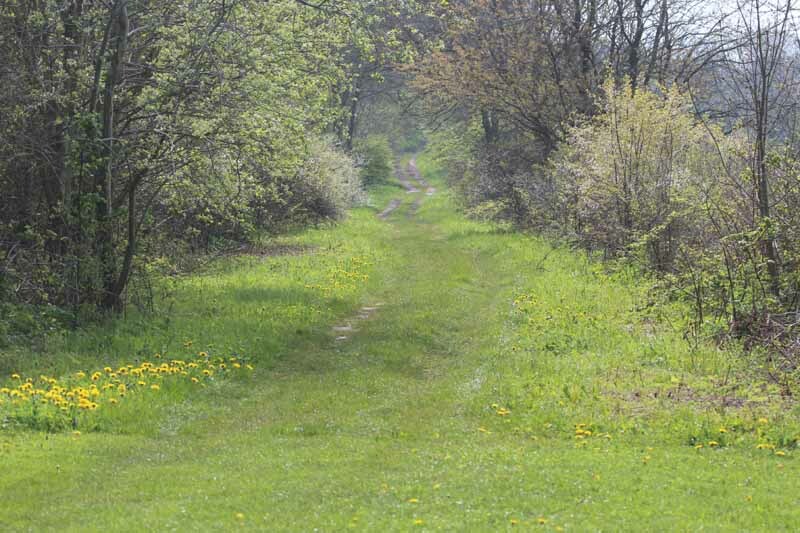 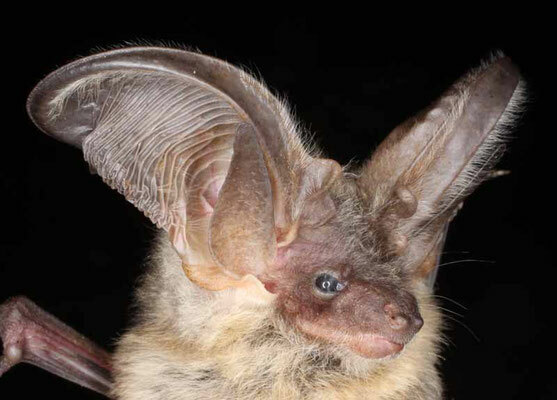 By banding migratory bats, we would like to learn more about the used migratory corridors and the connectivity between breeding and wintering habitats. 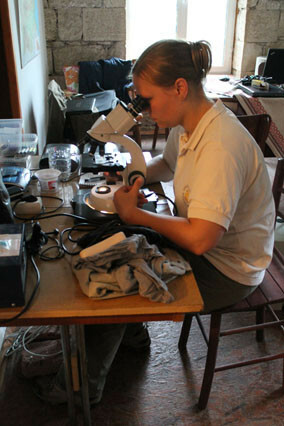 Further, we study various aspects of their biology to better understand the specific adaptations which enable them to travel seasonally over distances of about 4,000 km. 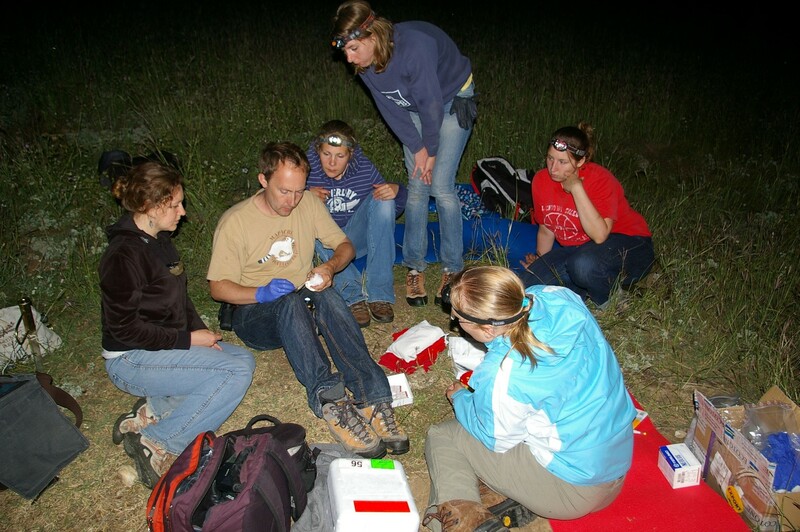 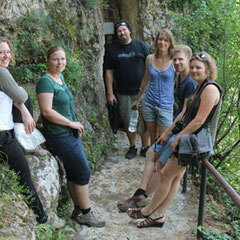 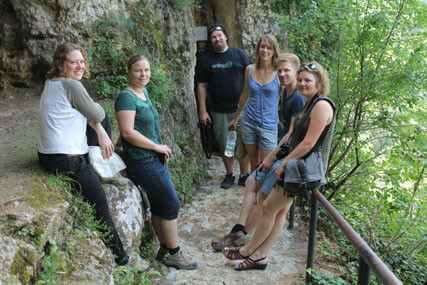 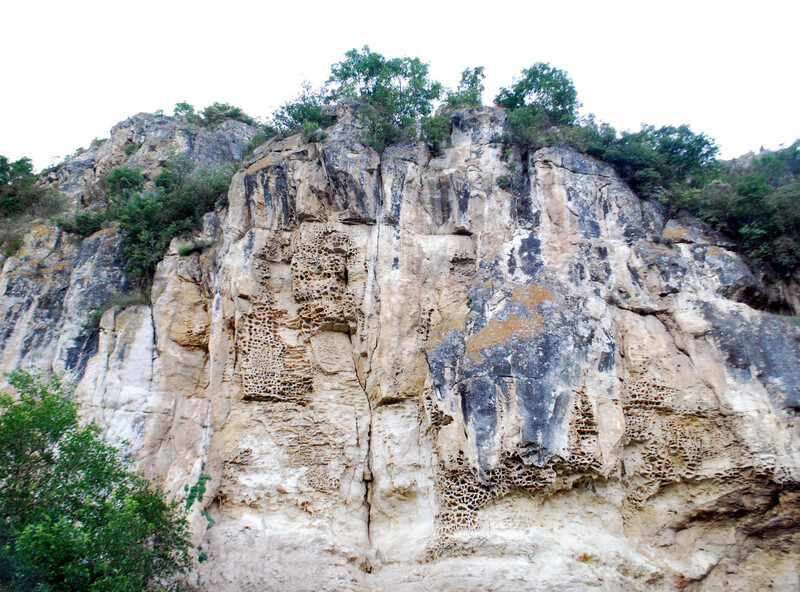 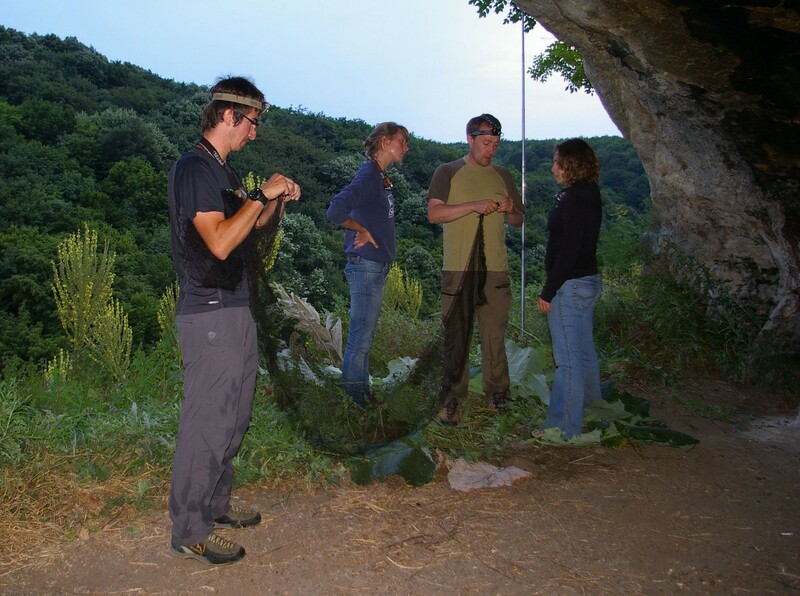 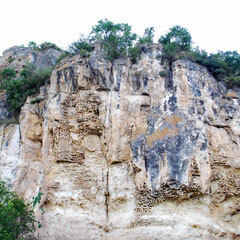 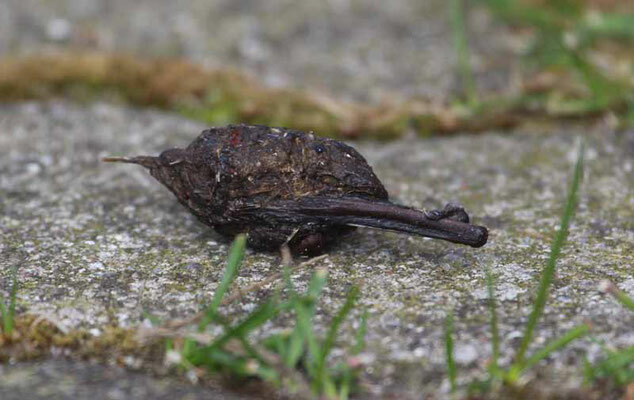 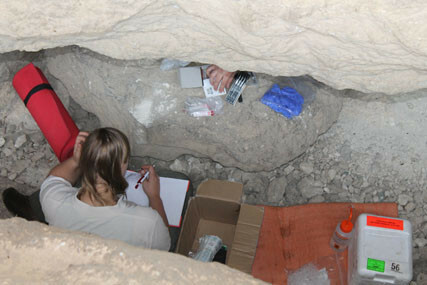 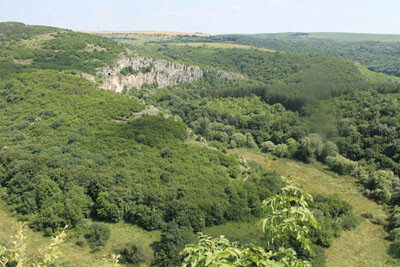 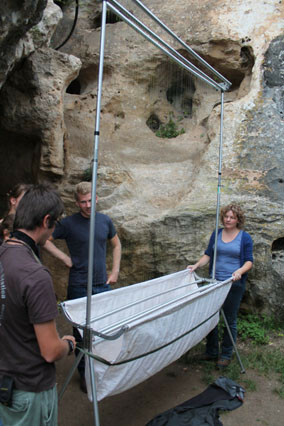 July 2014, Tabachka, Bulgaria: Group members studied the interplay between immunology, oxidative stress and longevity in European bat species. 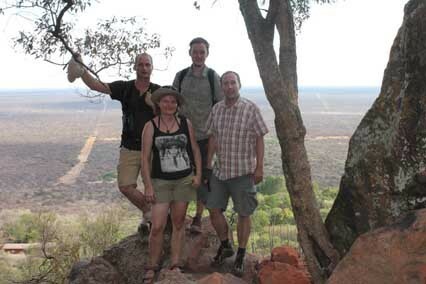 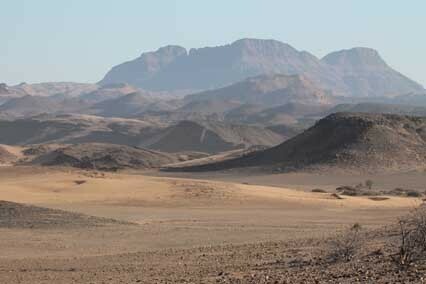 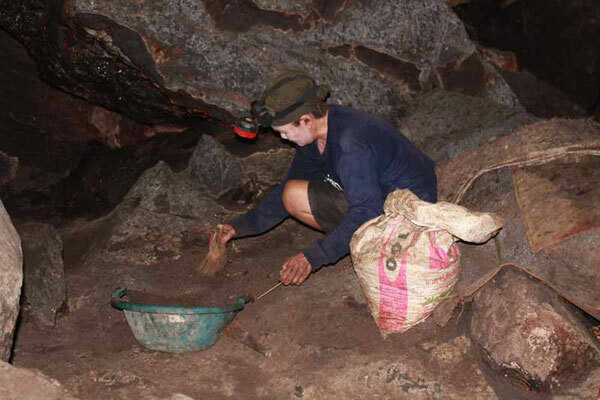 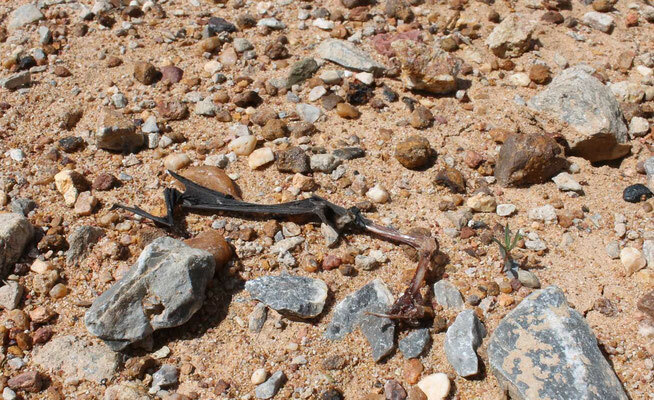 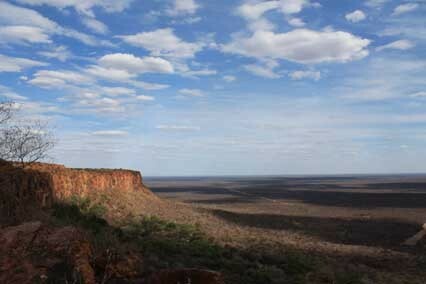 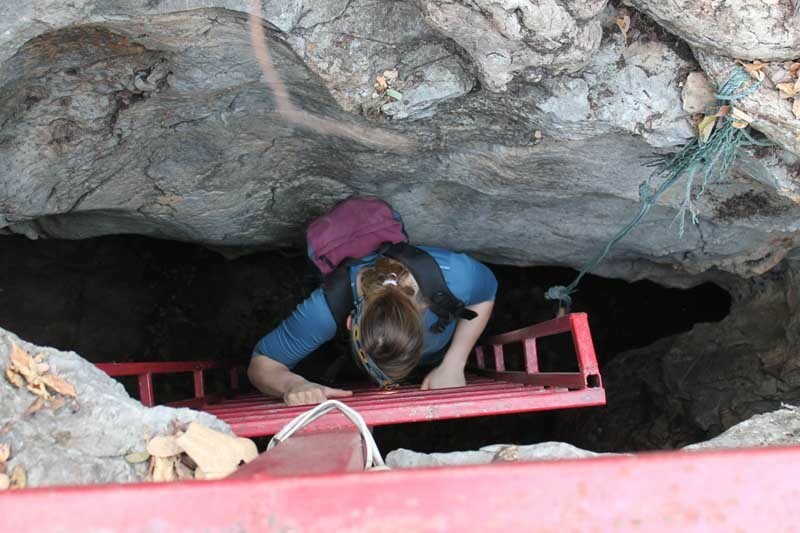 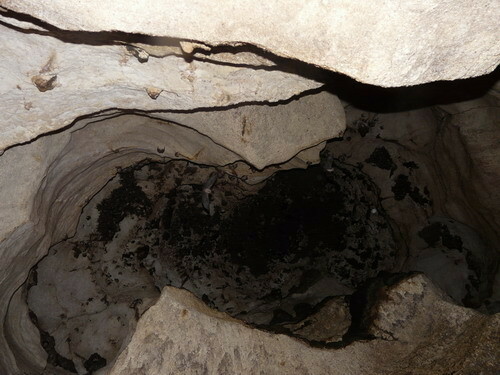 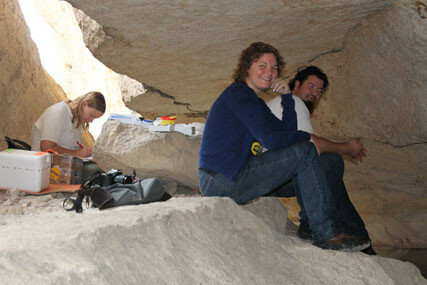 November 2013, Namibia: We reported to the authorities and local communities the results of the oryx project (www.oryxproject.de) and checked opportunistically for bats in local caves. 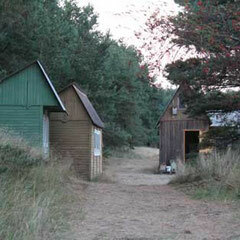 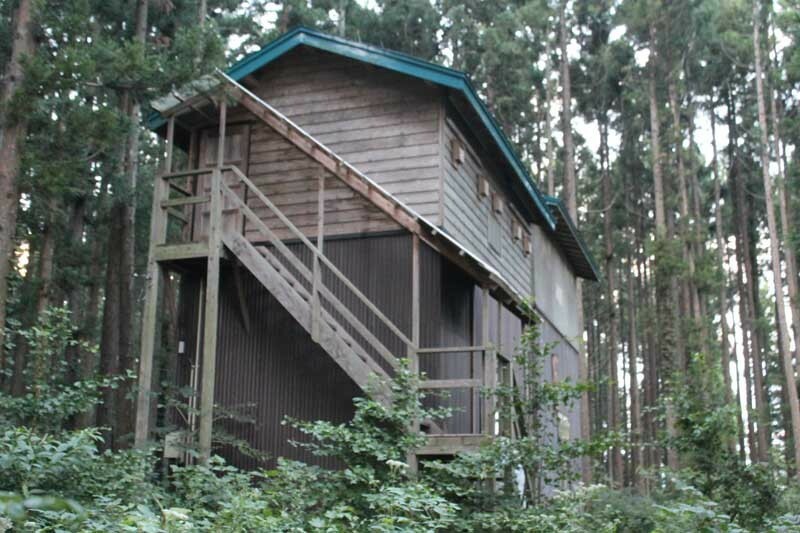 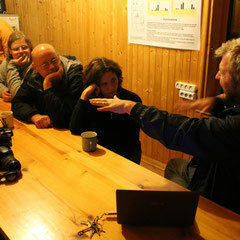 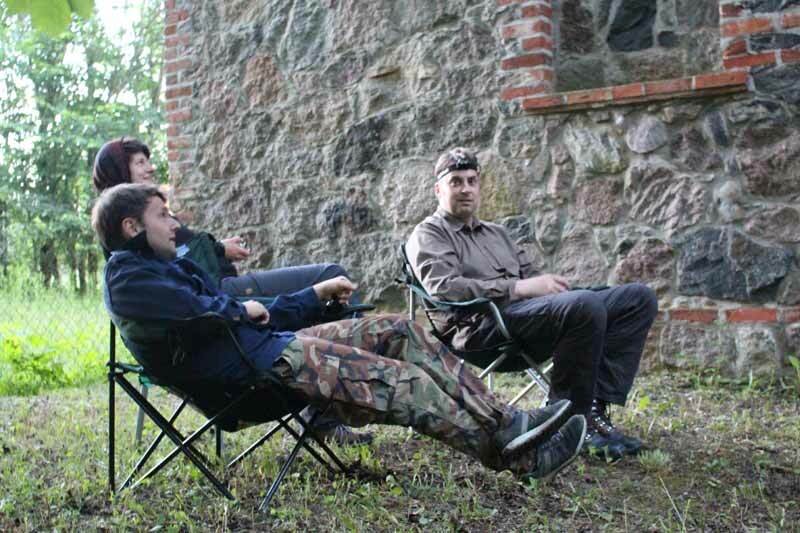 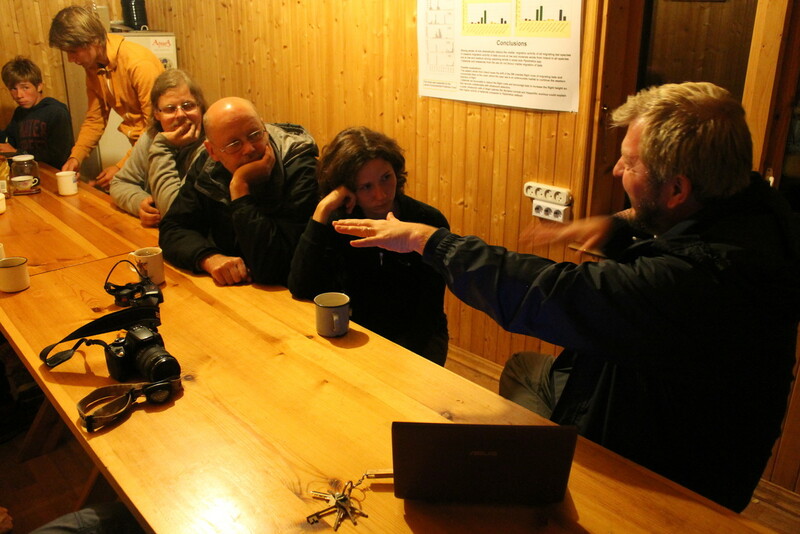 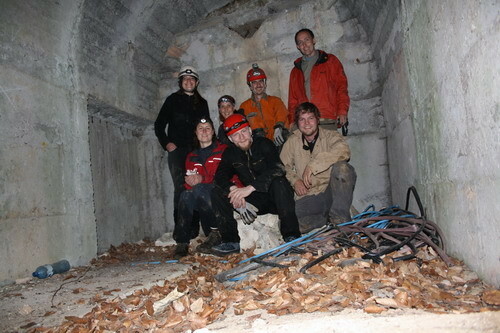 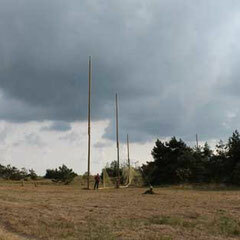 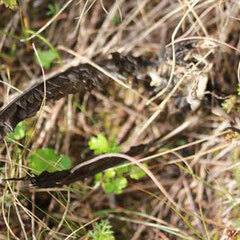 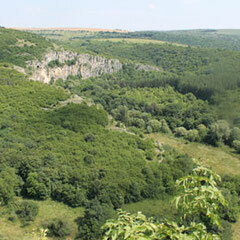 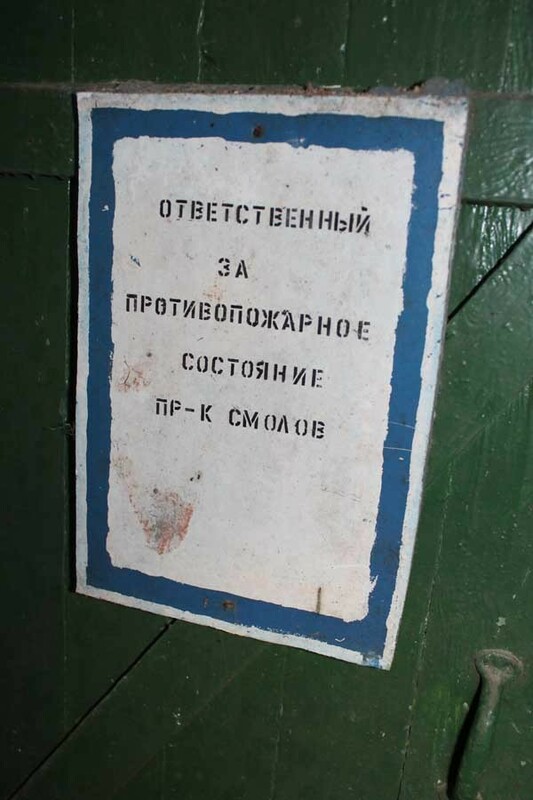 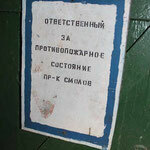 Winter 2012/2013: Hibernacula count in former bunkers of the USSR army in Germany. 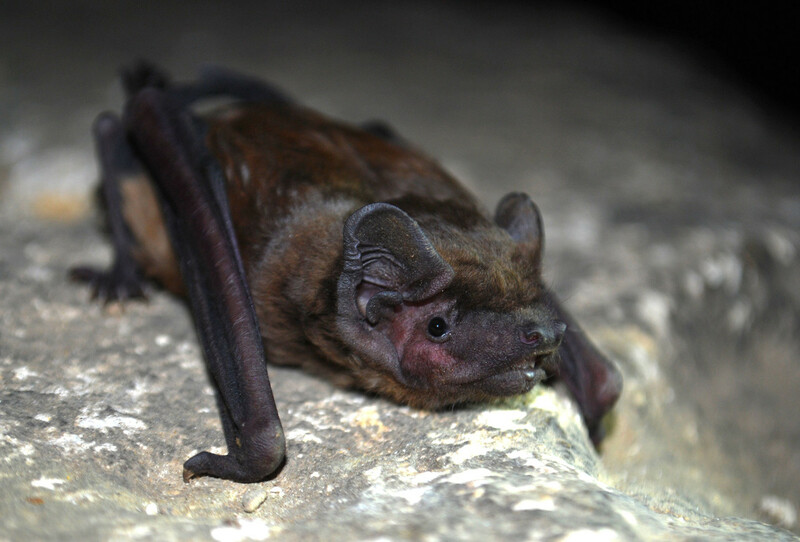 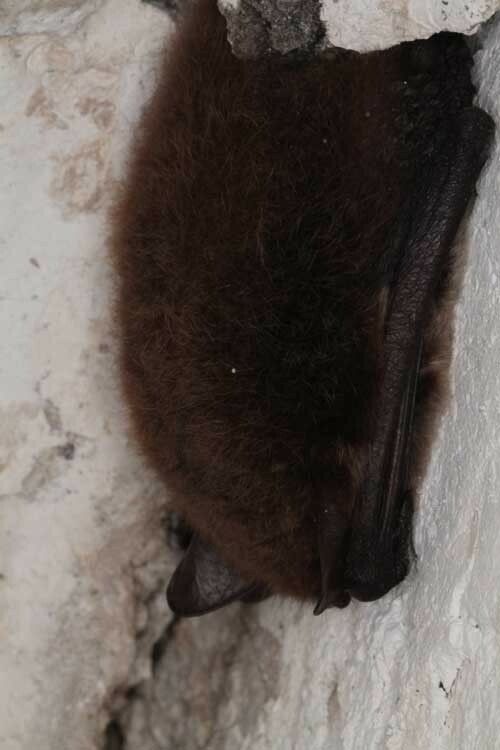 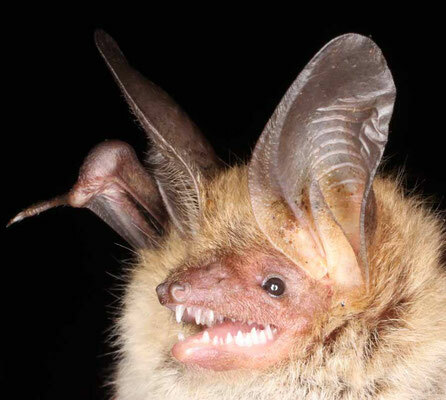 We recorded several hundred Barbastella barbastellus and some additional individuals of Plecotus austriacus and auritus and Myotis daubentoni and M. myotis. 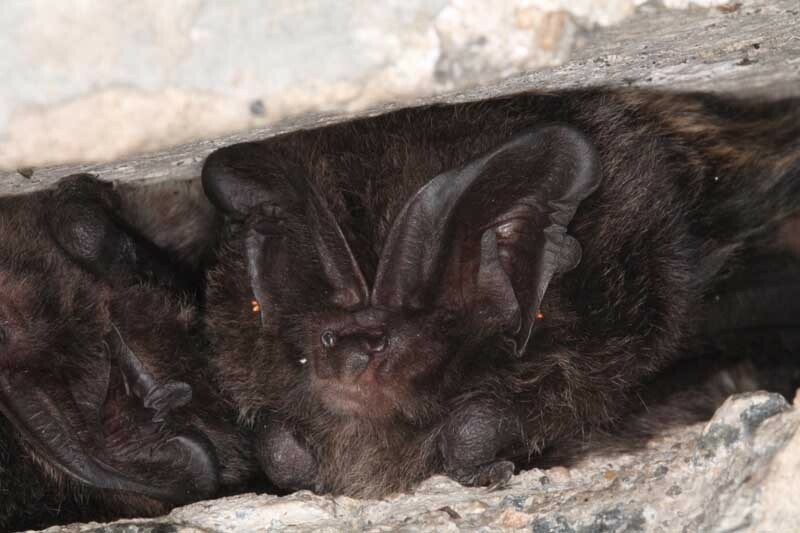 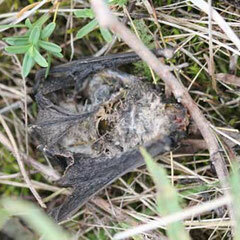 left: Greater mouse-eared bat (Myotis myotis), middle and right : Barbastella barbastellus. 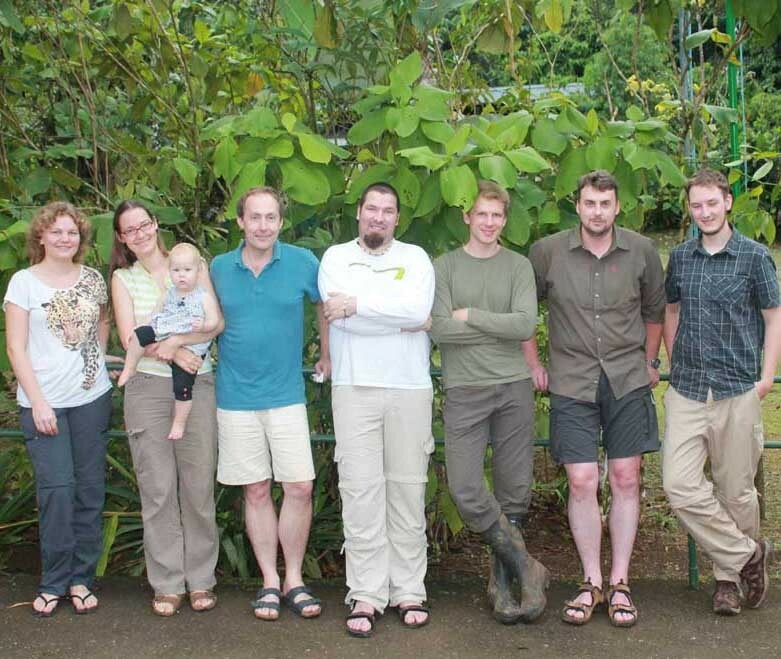 In November 2012, we spent a productive time at La Selva Biological Station (Costa RIca) working on eco-immunological and sociobiologial questions. 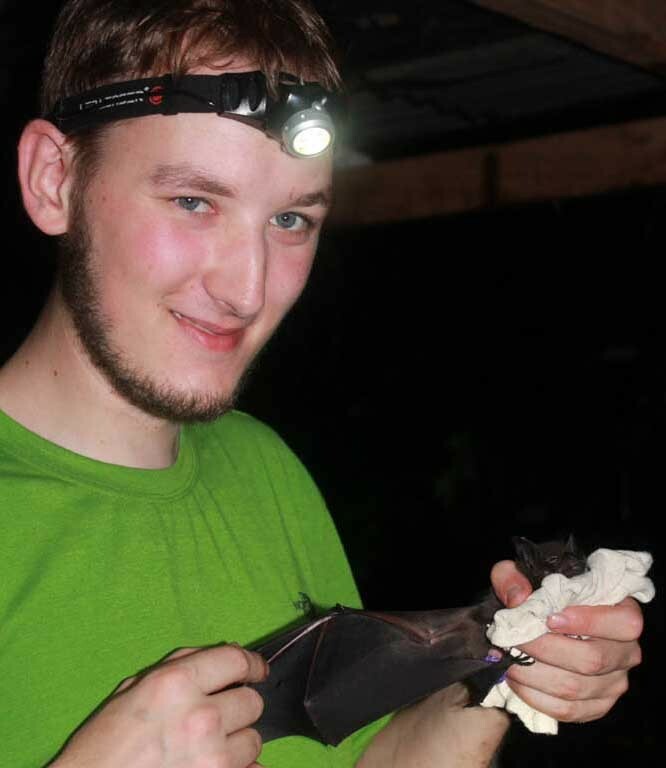 Despite the intense rainfall, we were able to capture more than 30 species within a short period of time. 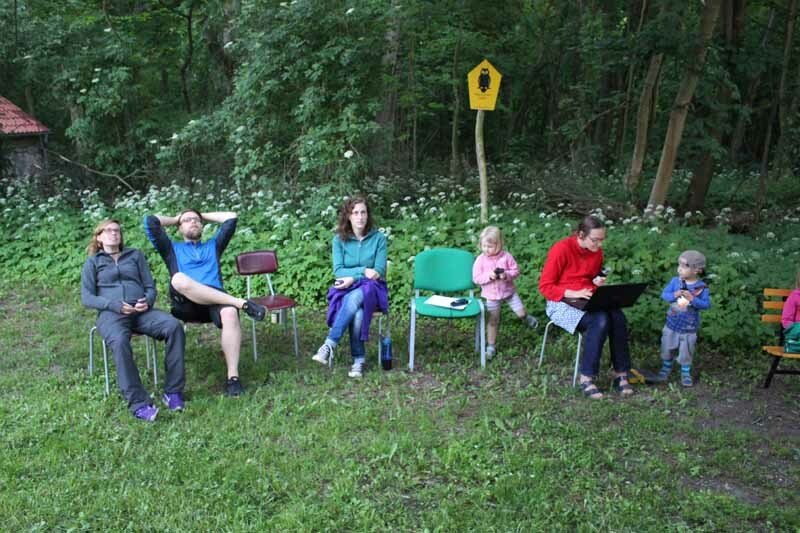 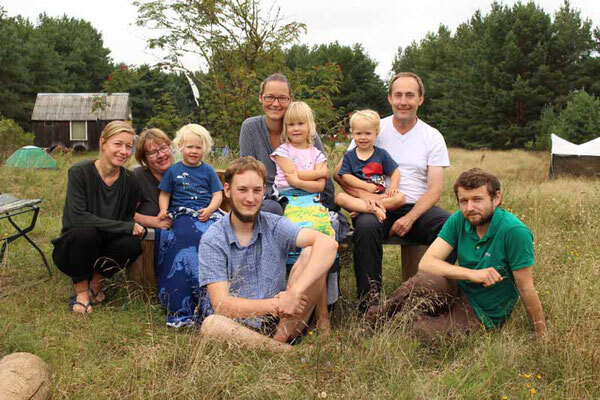 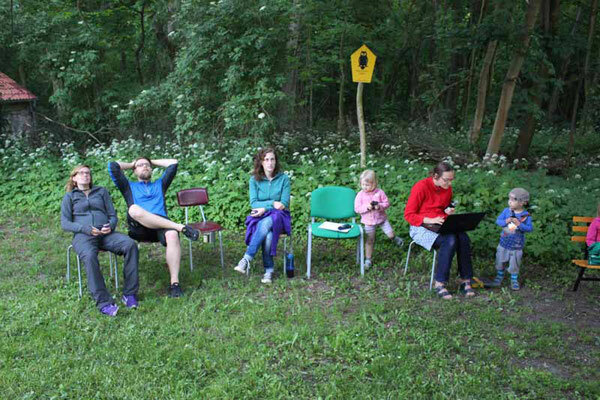 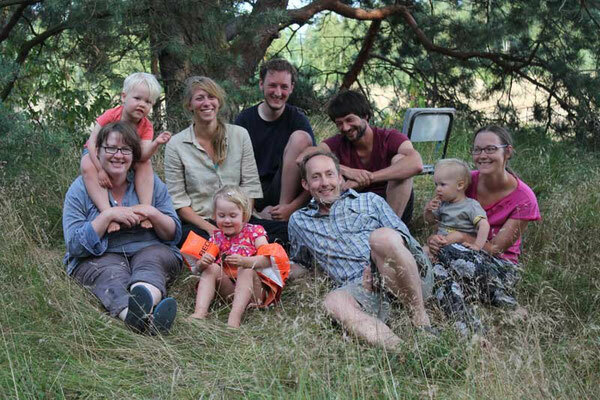 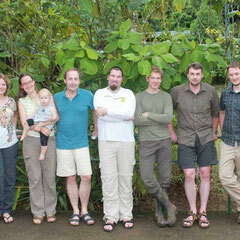 Pictures show (from top left to bottom right): the team (Karin Schneeberger, Silke Voigt-Heucke, Philippa Voigt, Christian Voigt, Gabor Czirjak, Daniel Lewanzik, Tobias Teige, Oliver Lindecke), Oliver L. at work, Desmodus rotundus, Ectophylla alba, Lonchophylla robusta, Phyllostomus hastatus. 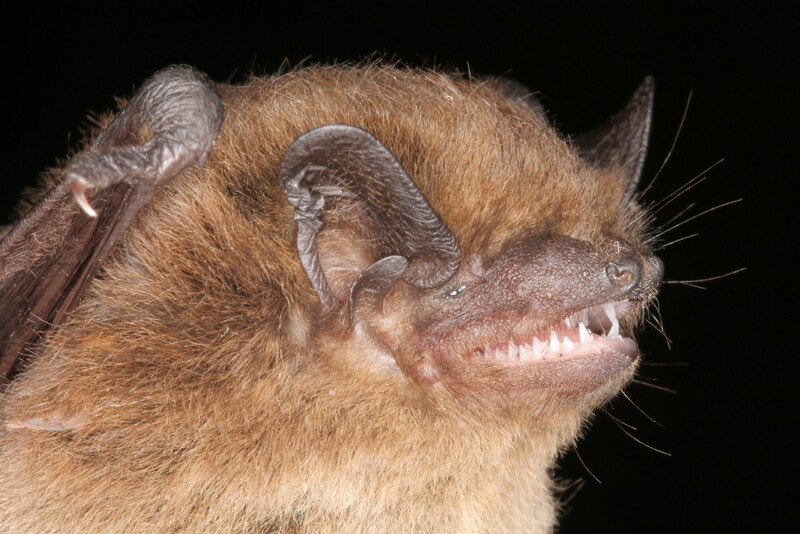 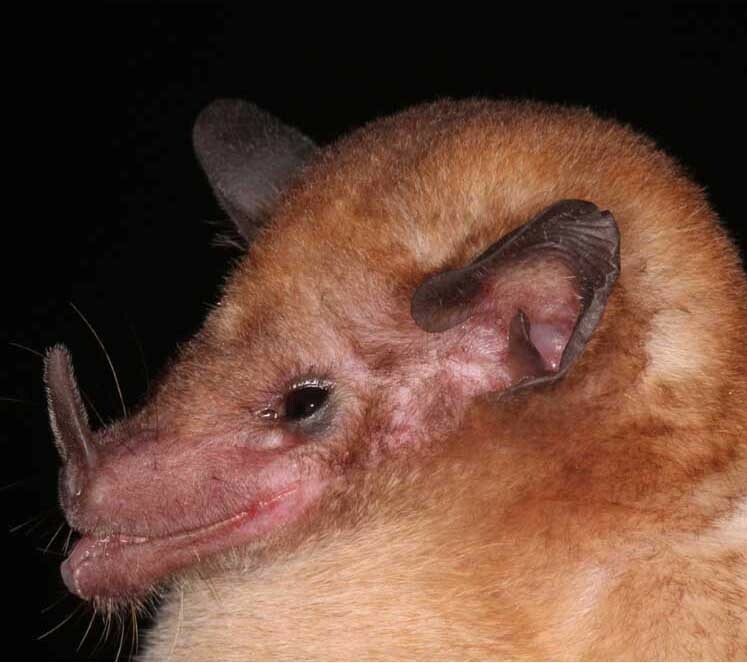 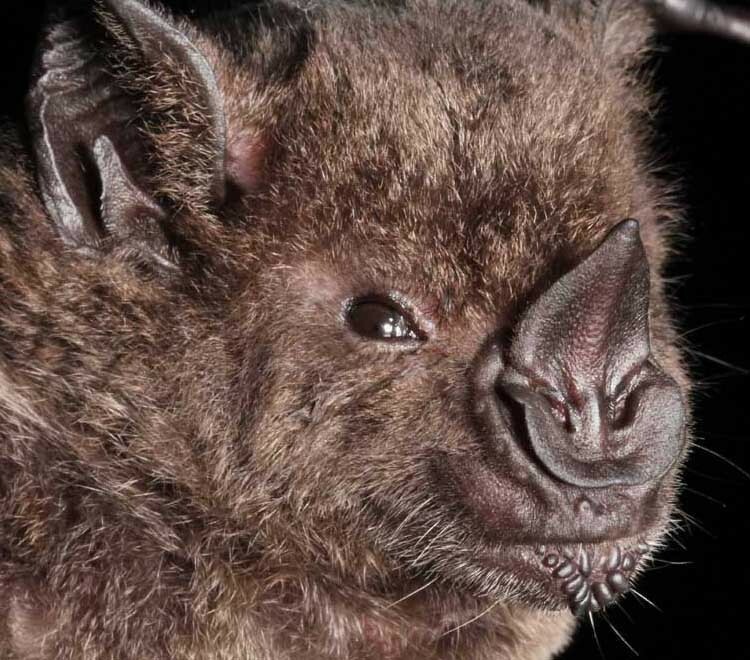 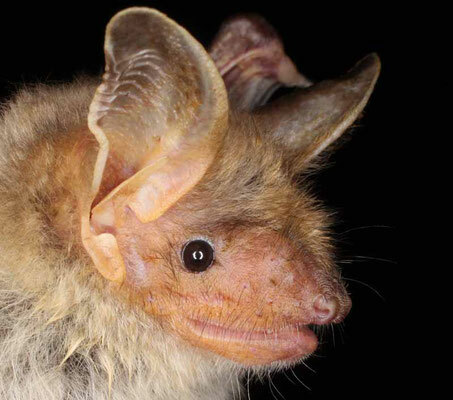 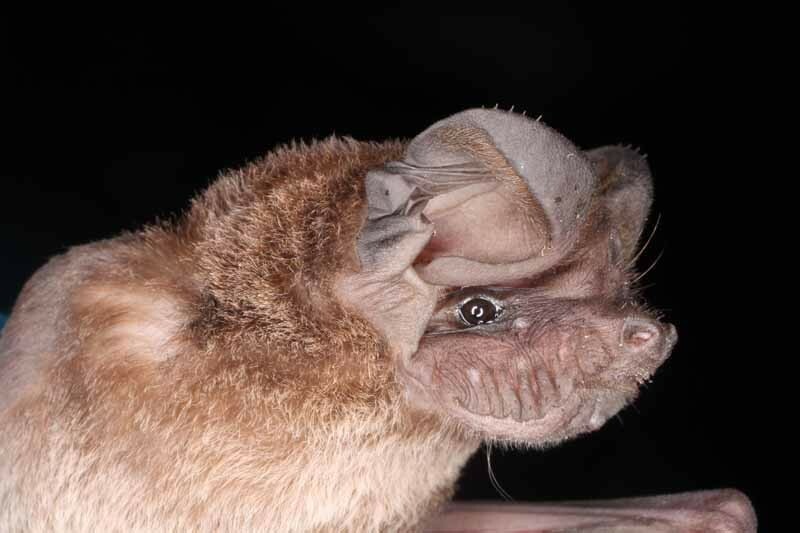 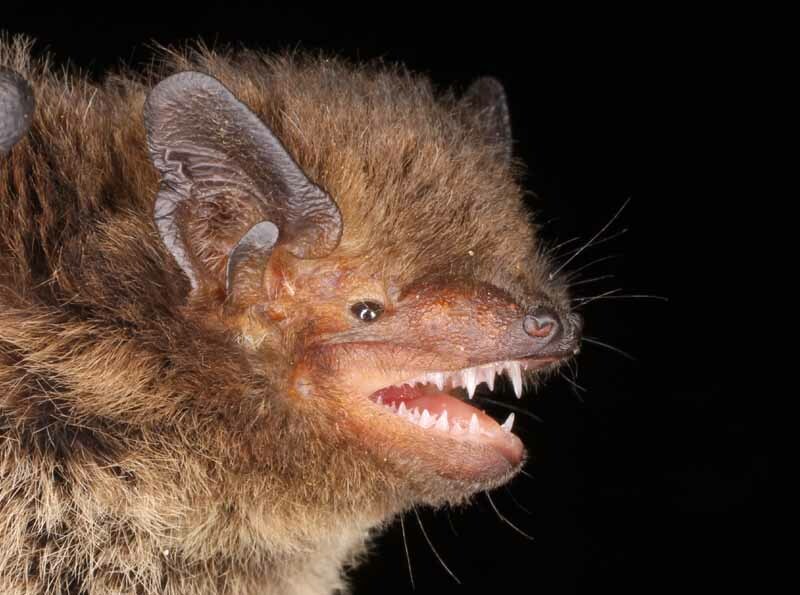 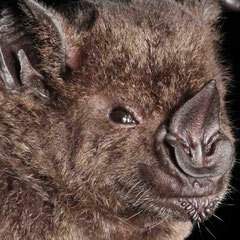 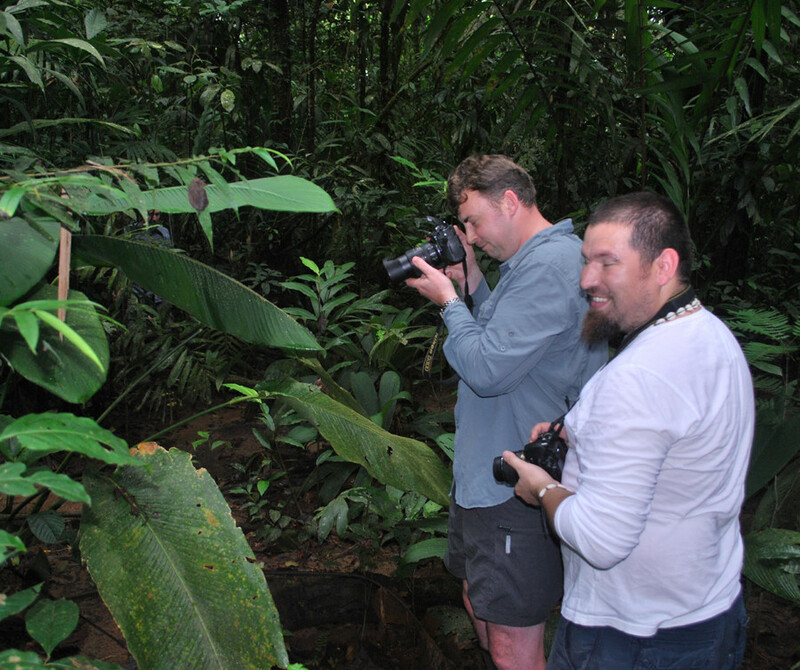 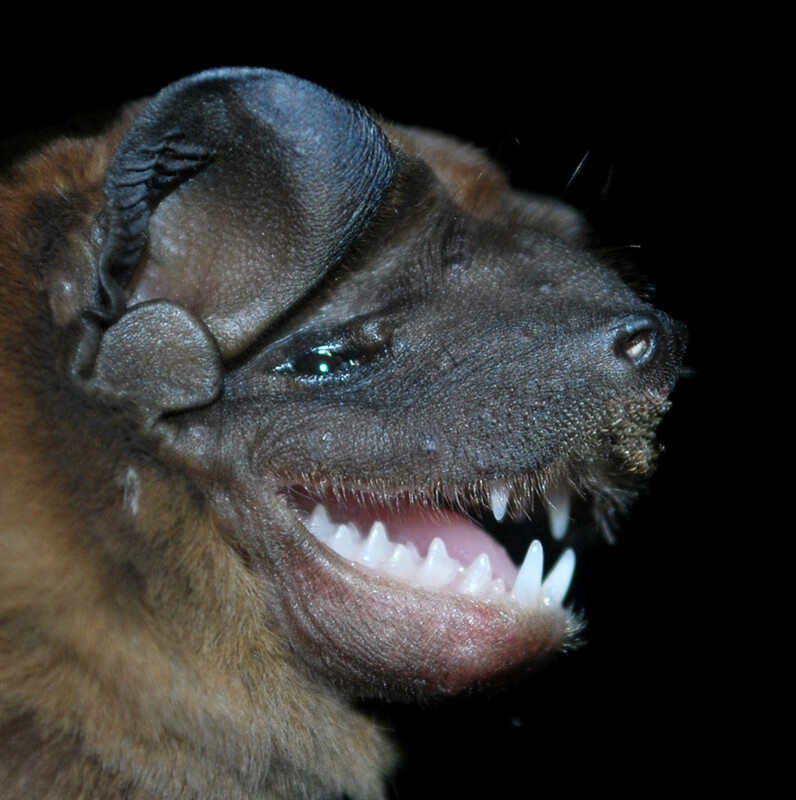 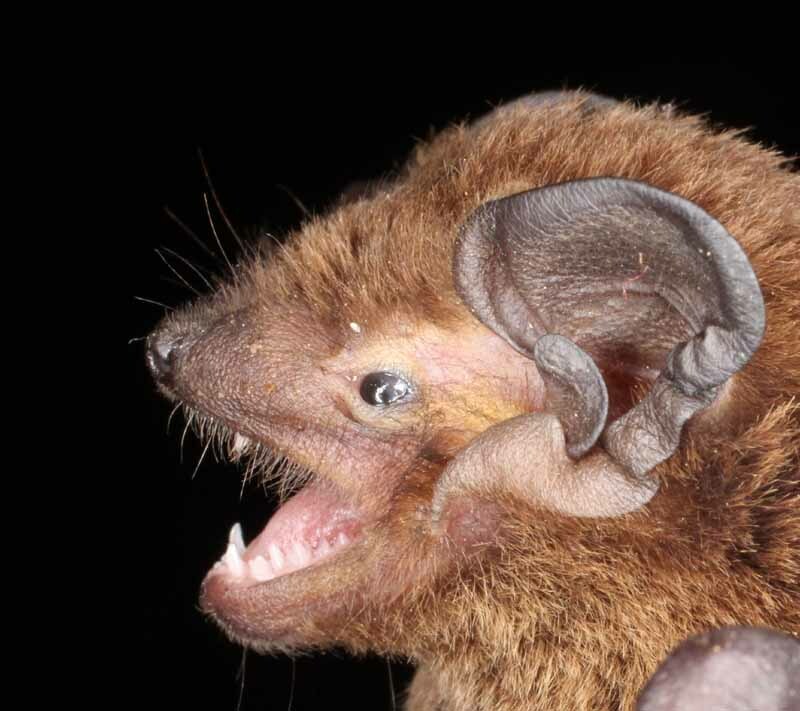 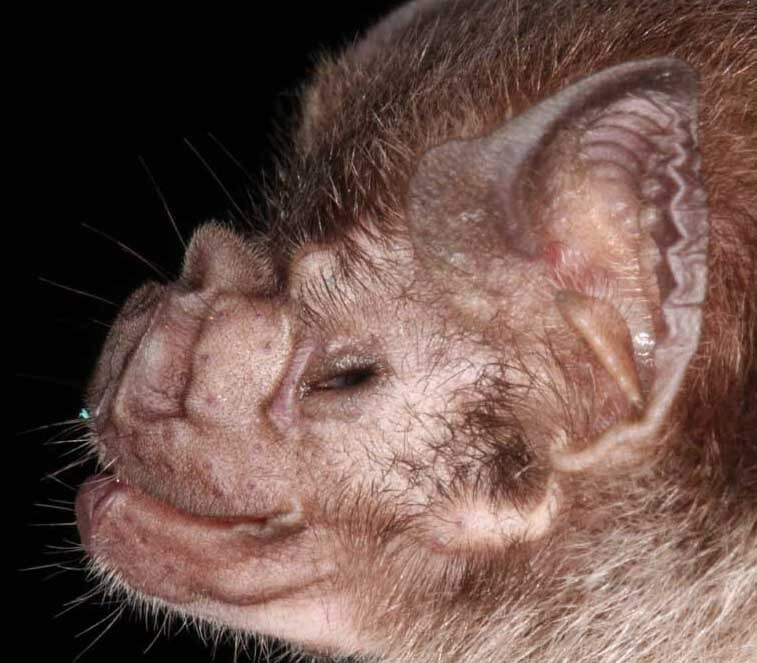 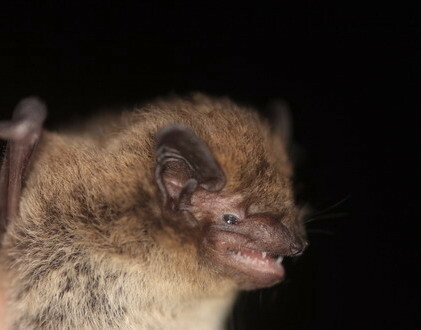 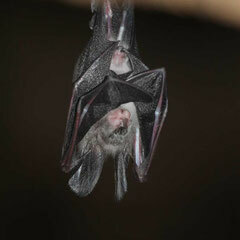 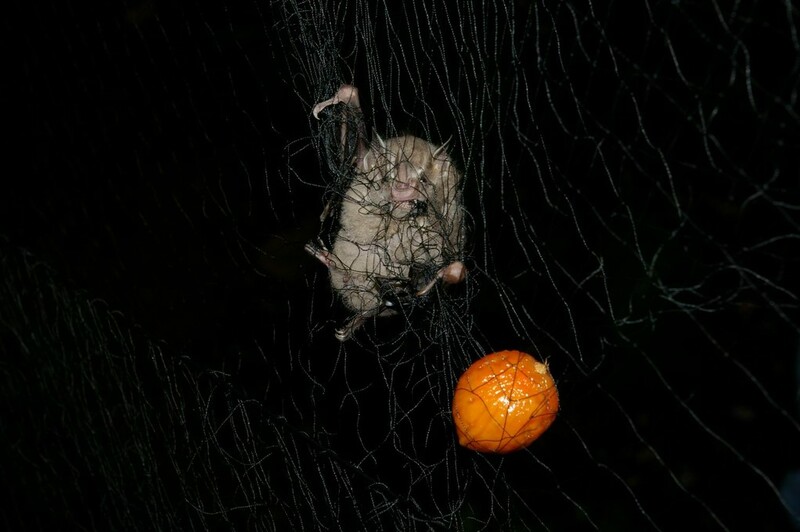 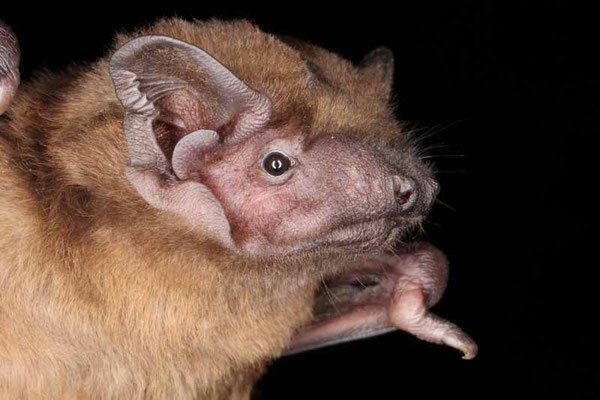 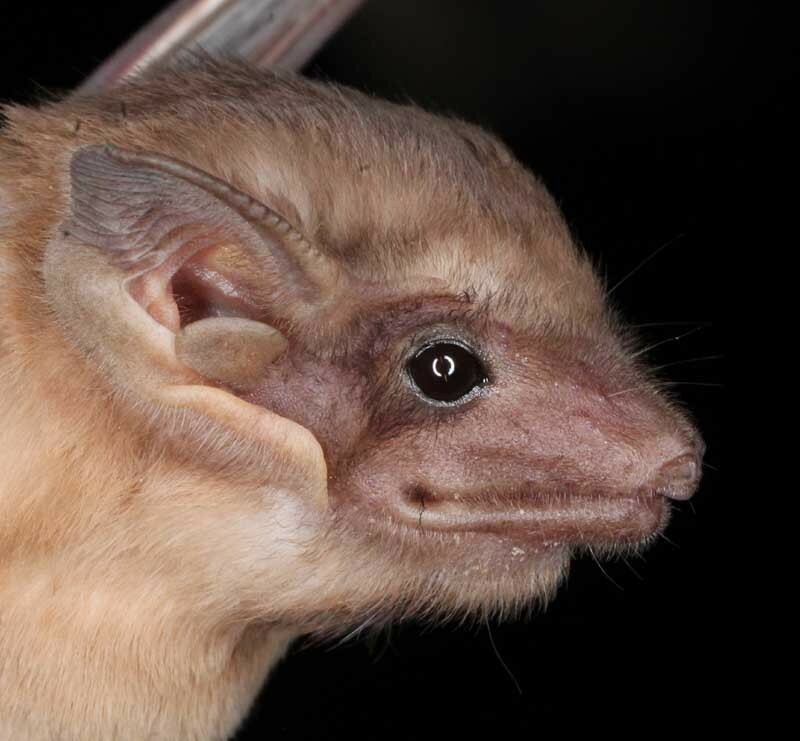 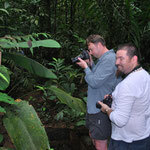 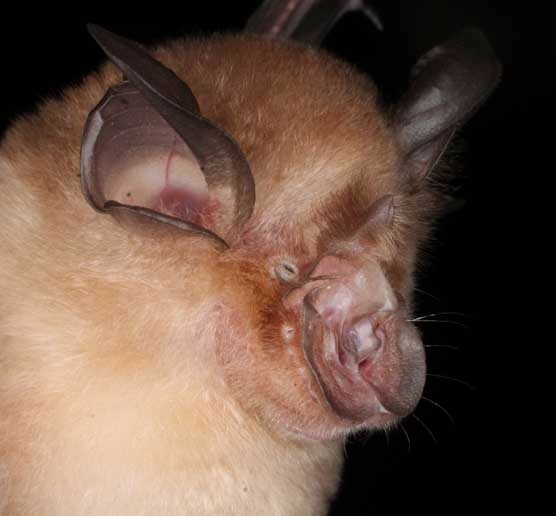 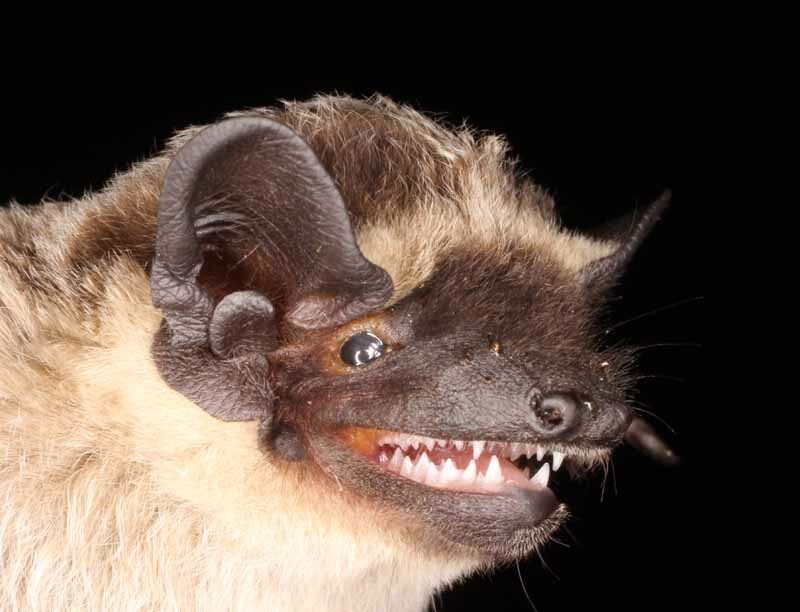 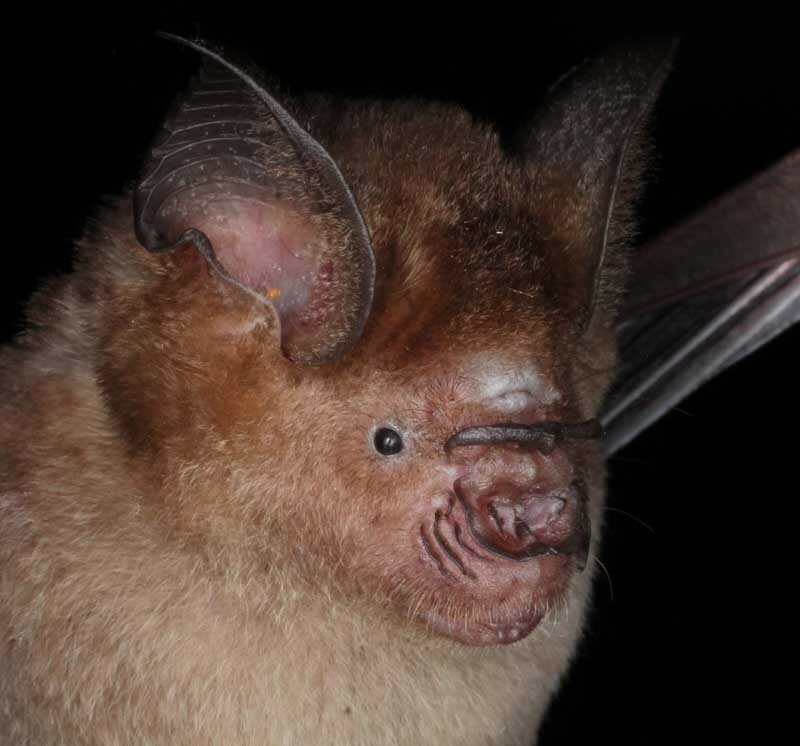 Molossus sinaloae (smiling), Tobias and Gabor enjoying an Ectophylla tent, the smallest (4 g Ectophylla alba) and the largest fruit-eating bat (120 g P. hastatus) of La Selva Biological Station ((C) O. Lindecke). 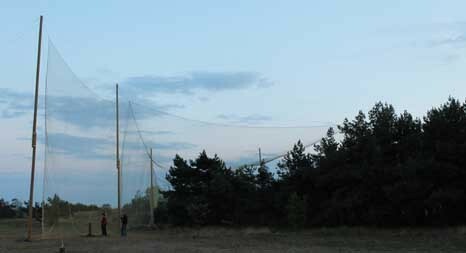 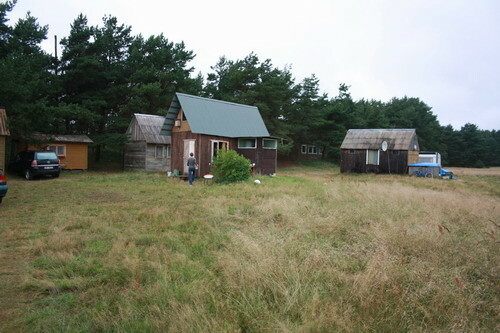 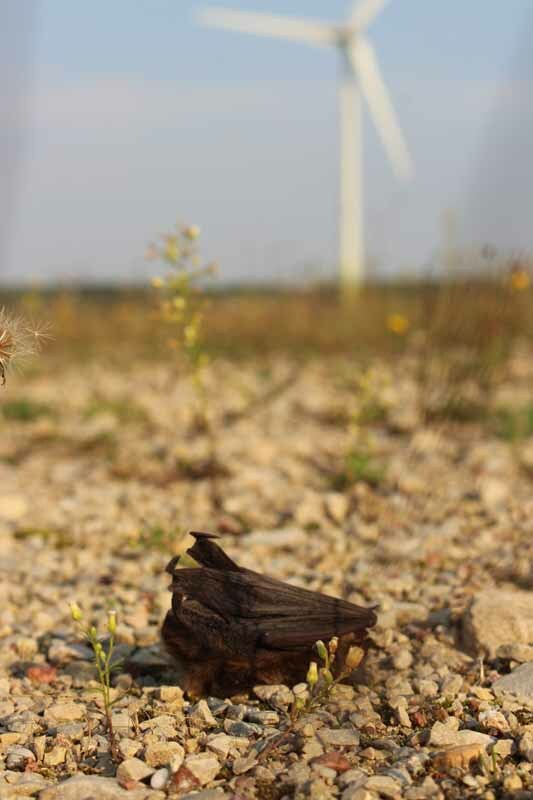 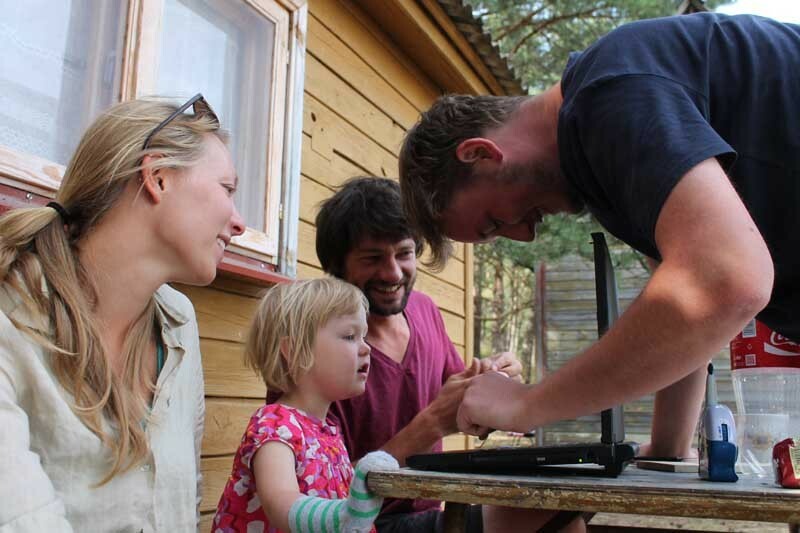 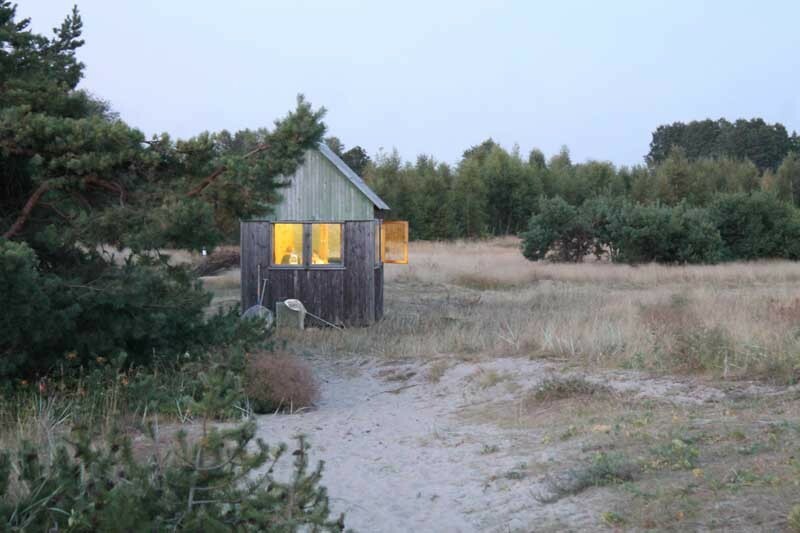 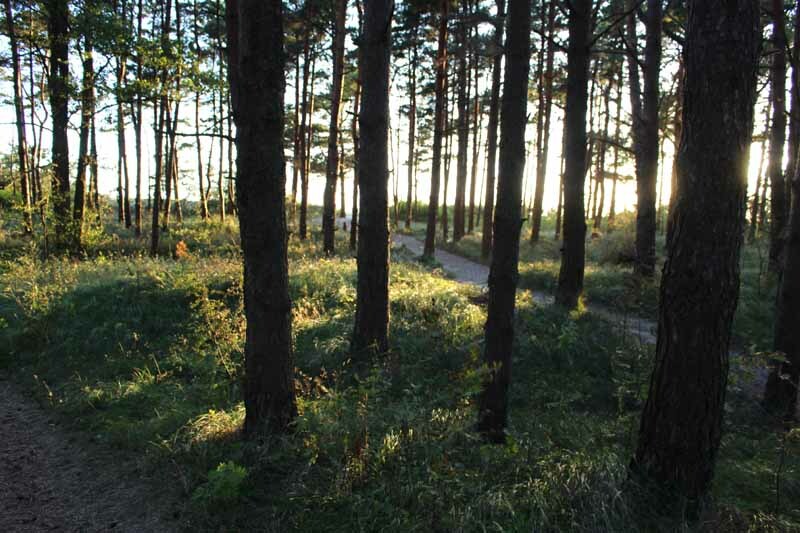 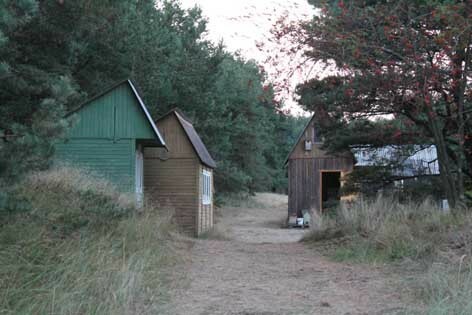 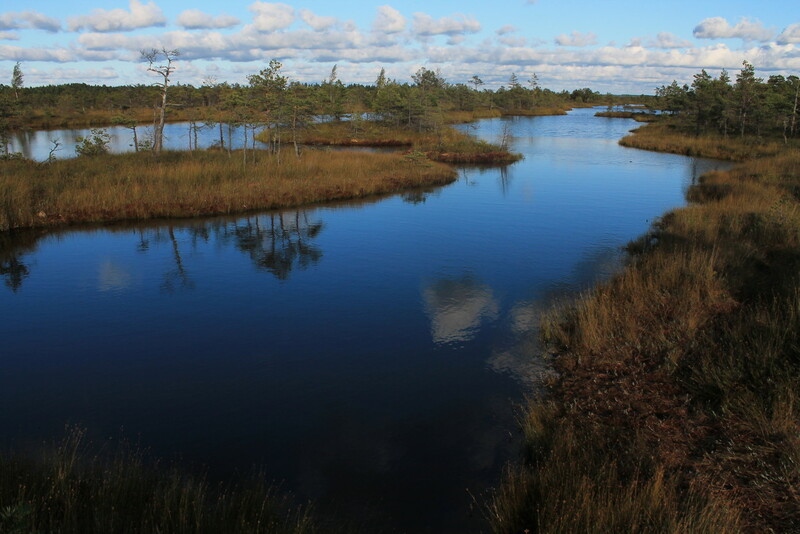 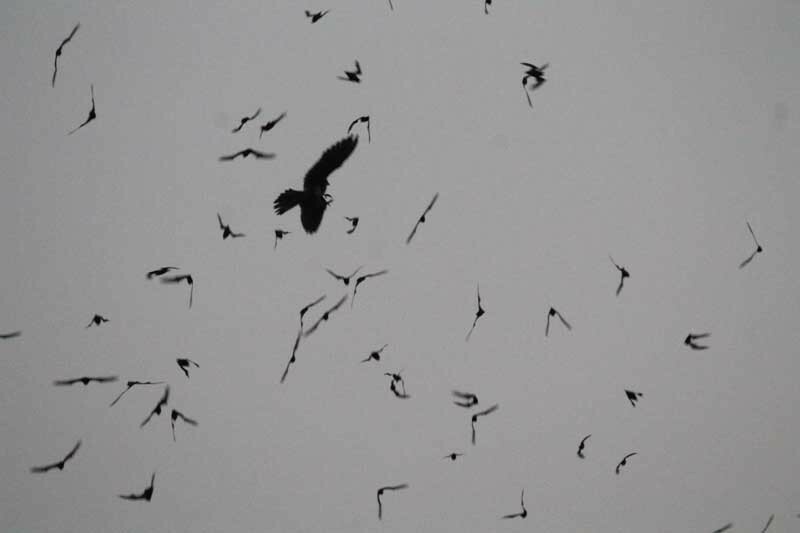 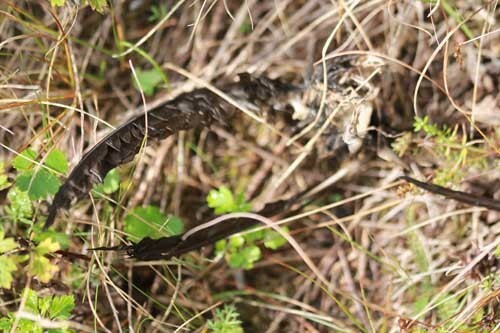 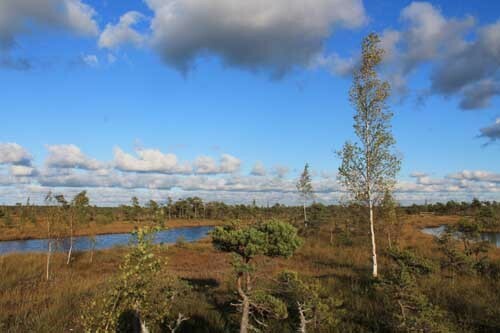 In August 2011, we spent a very productive time at Pape Bird Ringing Station in Latvia to work on the migratory ecology of Pipistrellus nathusii. 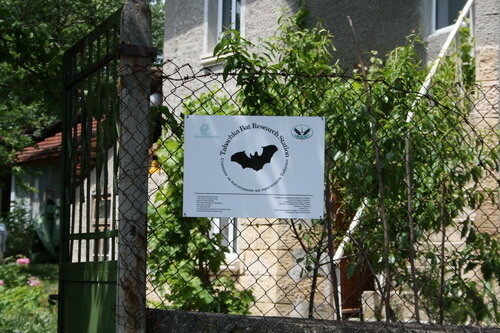 We enjoyed a series of seminary talks about bat migration research conducted at Pape Bird Ringing Station,and contributed with our own presentation to this productive scientific meeting. 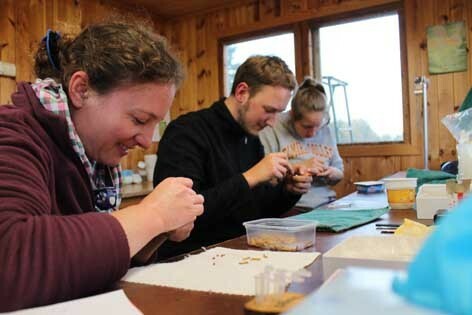 The students from Latvia greatly helped in some field experiments with Pipistrellus nathusii (results are now published in Voigt et al. 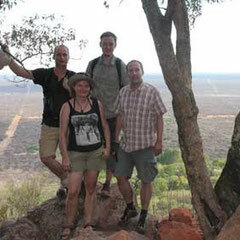 2012 Proc Roy Soc Lond B). 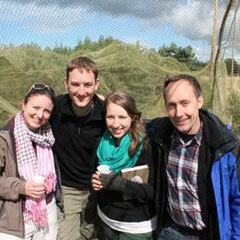 We are most grateful to our local hosts Prof. Dr. Gunars Peterson and Dr. Oskars Keiss for their hospitality. 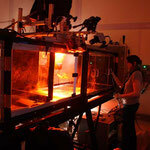 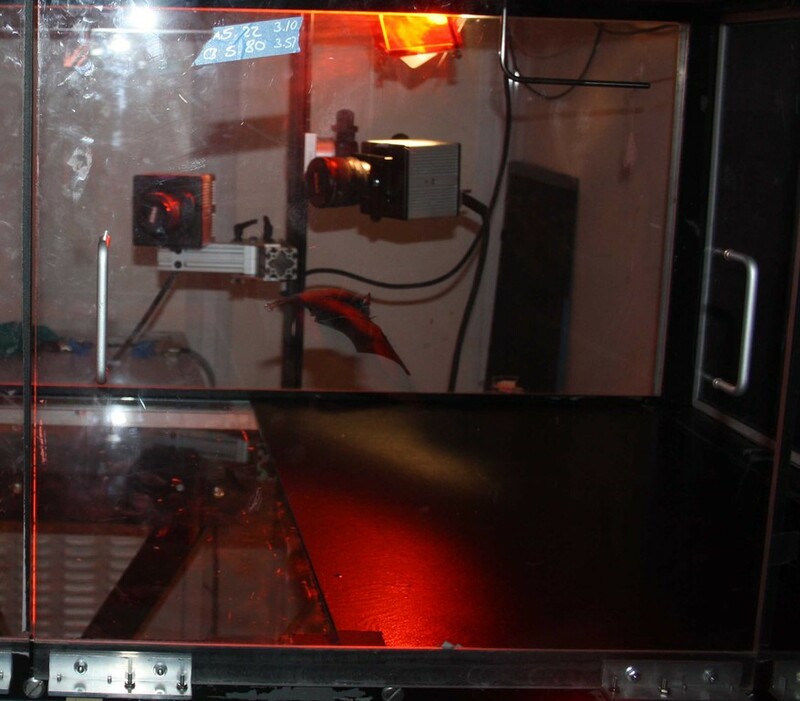 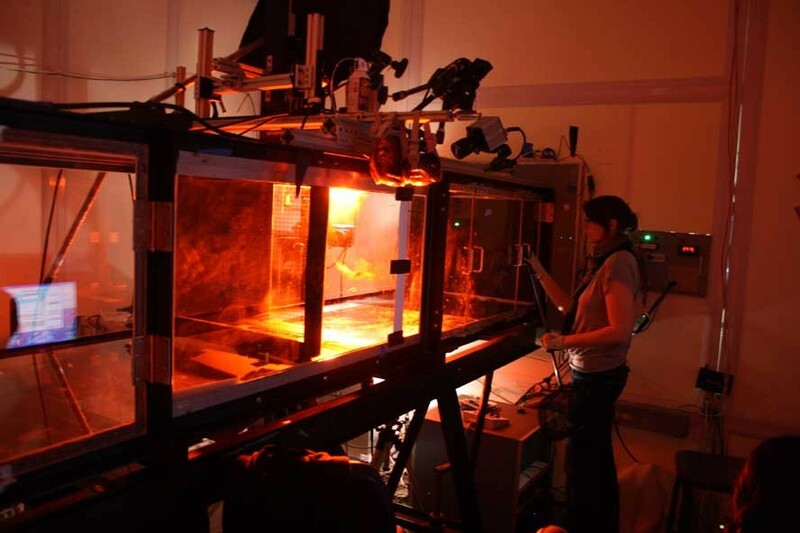 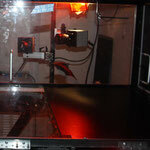 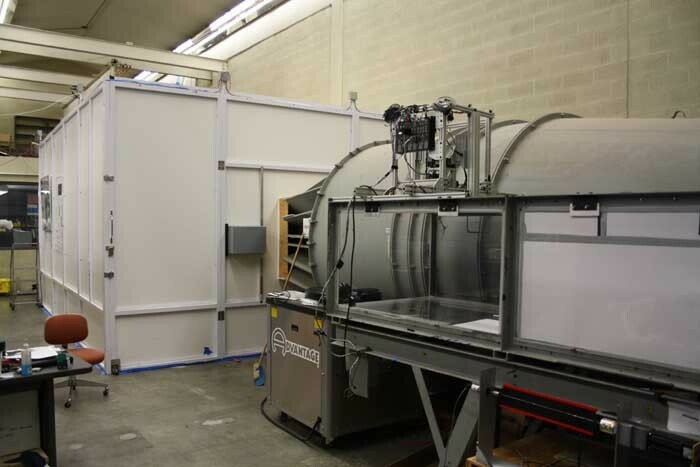 We measured flight performance and metabolic rates of short-tailed fruit bats while flying in a wind tunnel. 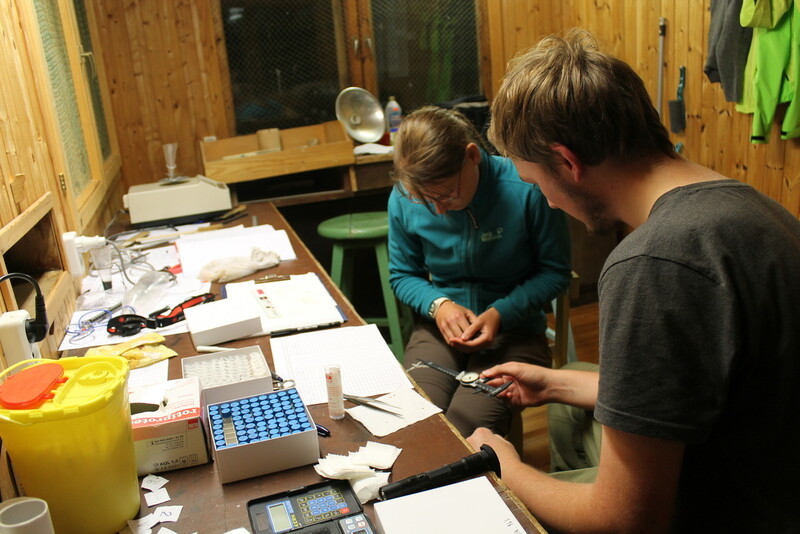 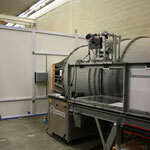 Our overall goal was to test whether metabolic rate varies with flight speed as predicted by theory, i.e. 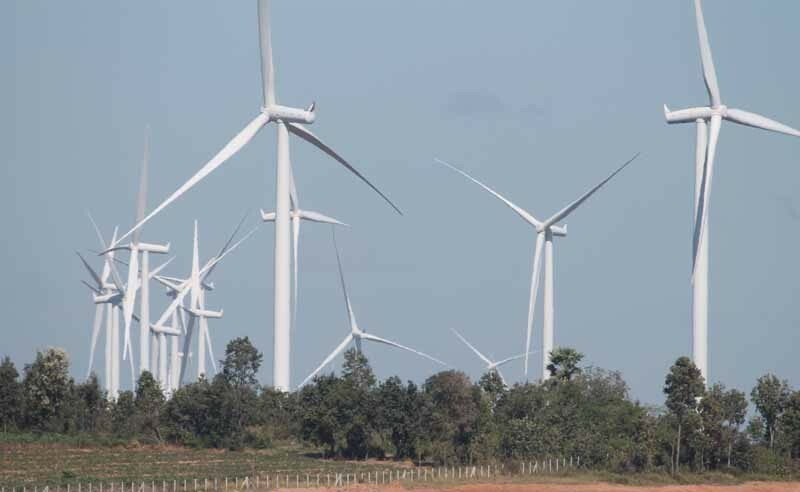 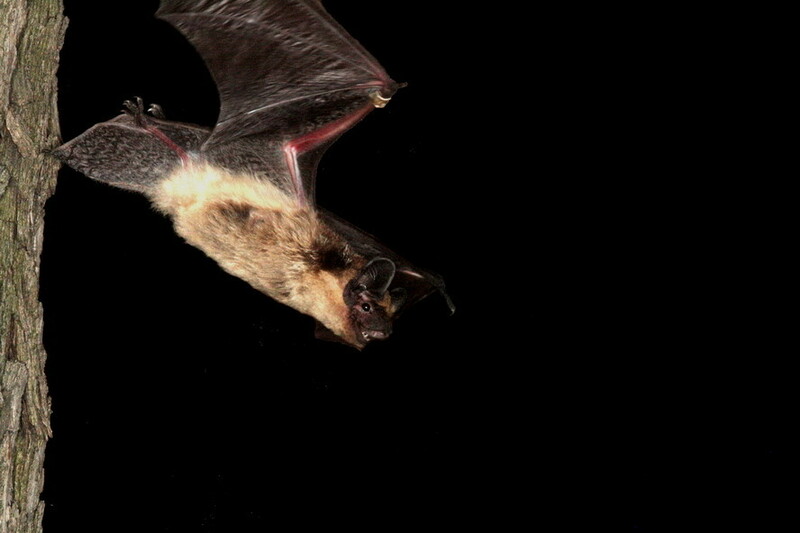 in a U-shaped manner with intermediate speeds coming at lowest metabolic costs for flying bats and slow and fast flight coming at higher metabolic costs. 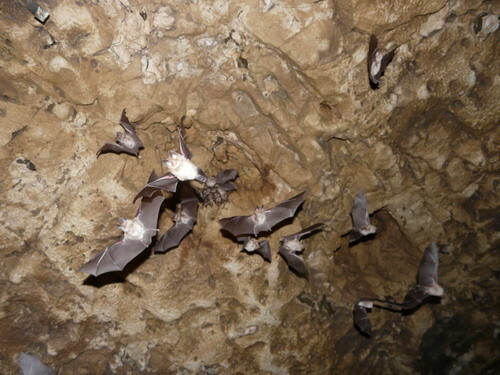 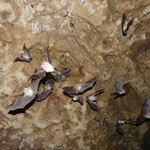 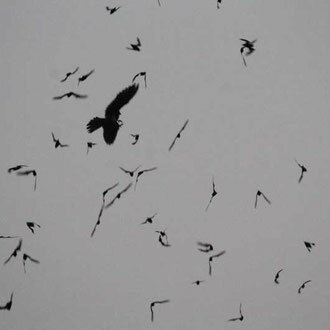 Counting bats emerging from a maternity roost of Vespertilio murinus. 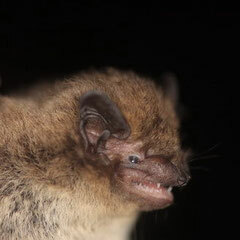 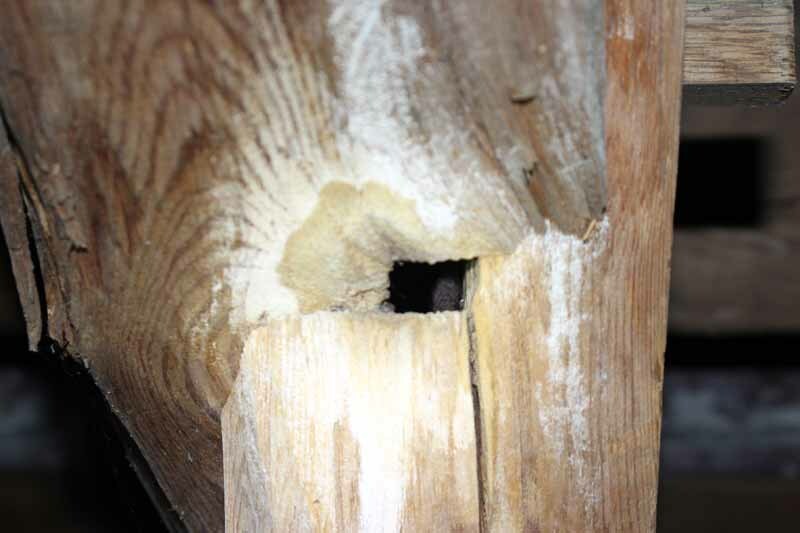 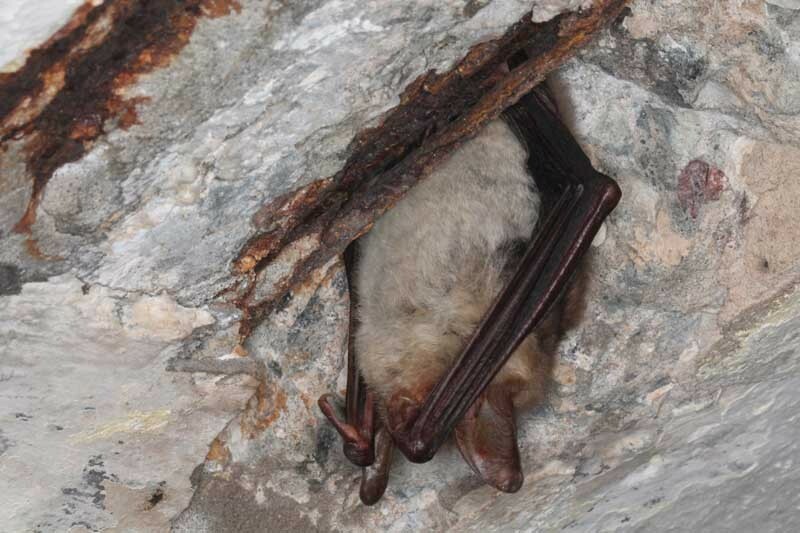 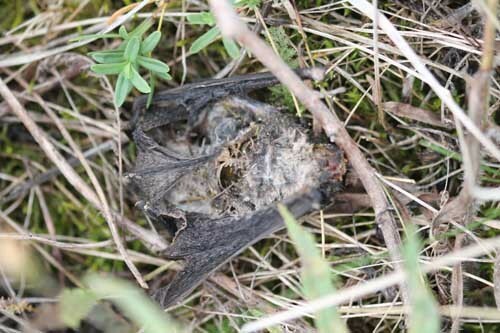 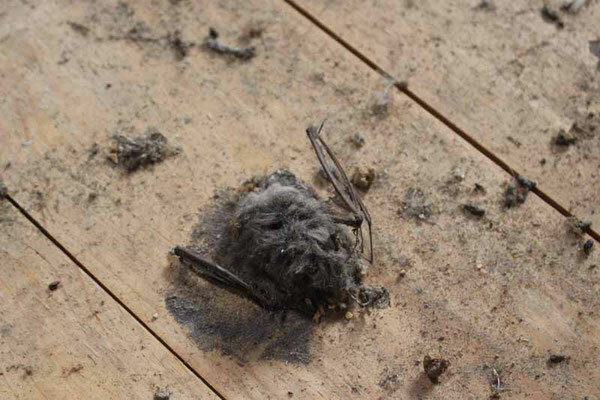 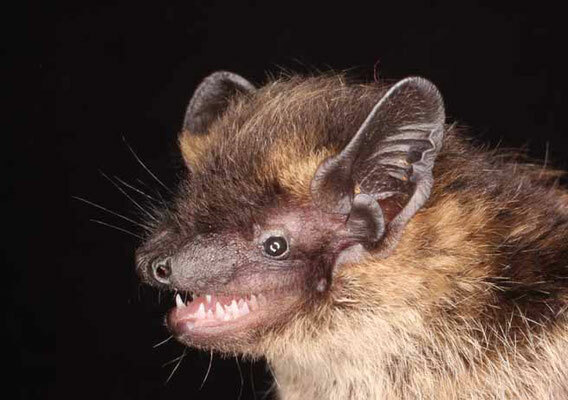 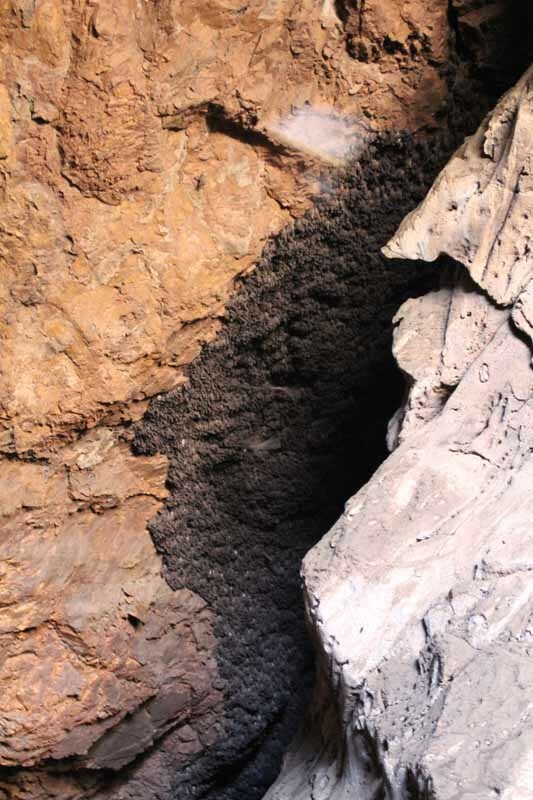 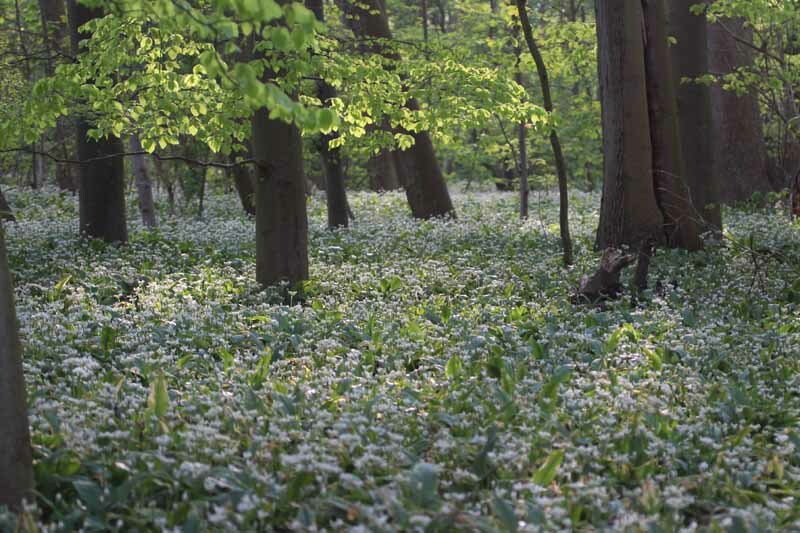 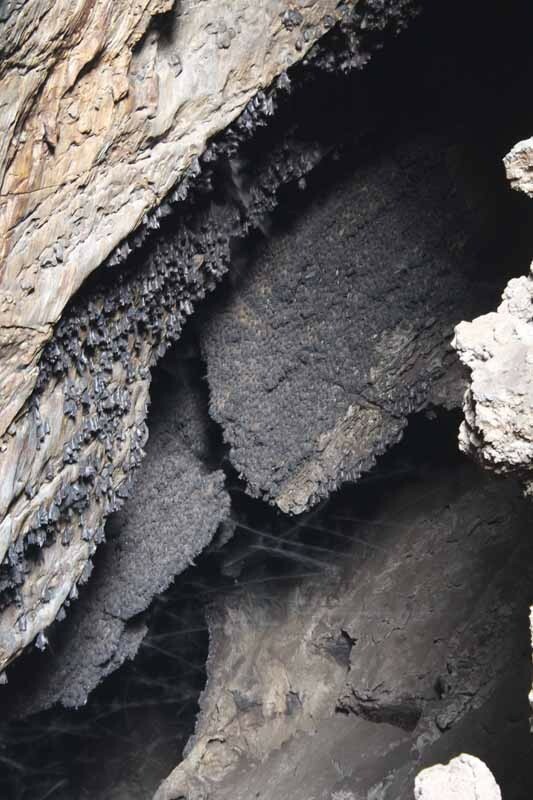 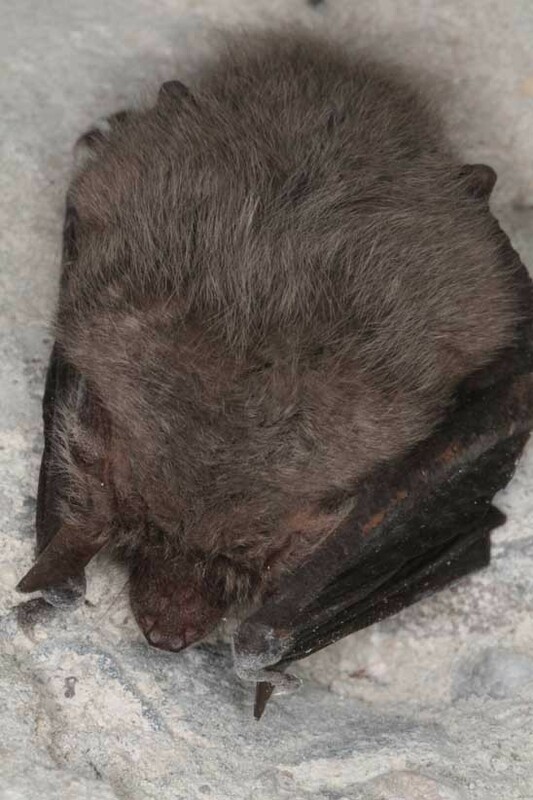 During winter, all bats of the temperate zone aggregate in hibernacula where they spend several months with a reduced metabolic rate and body temperature. 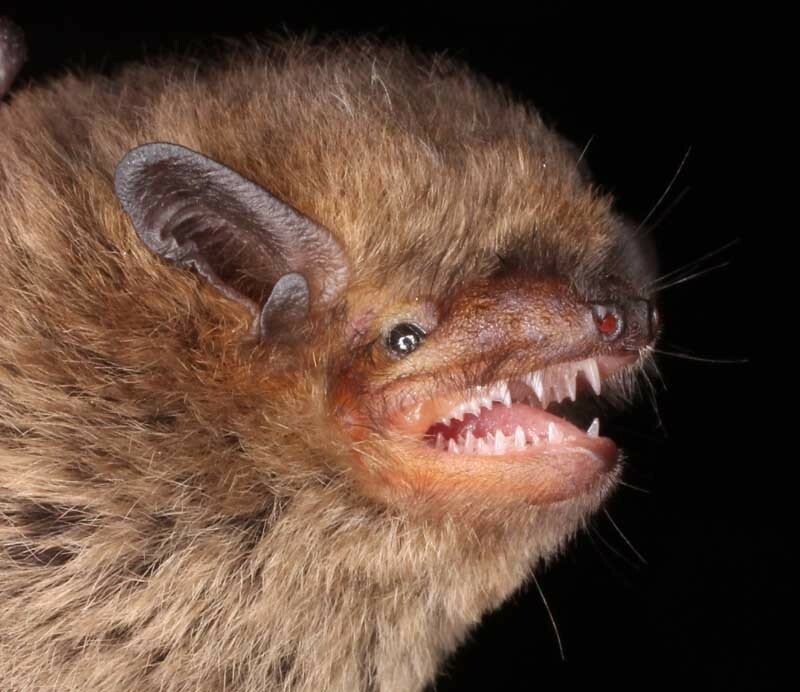 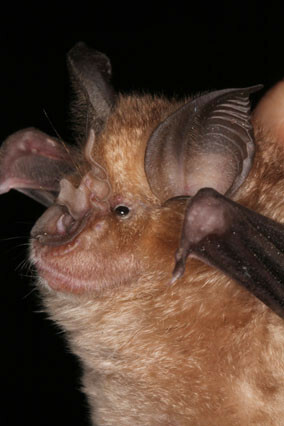 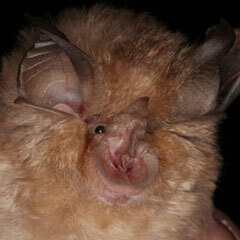 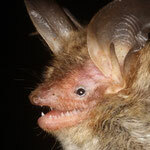 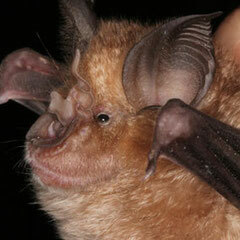 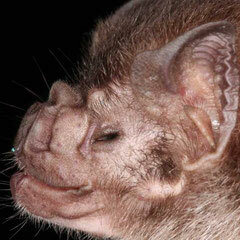 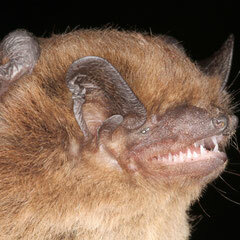 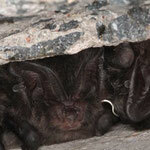 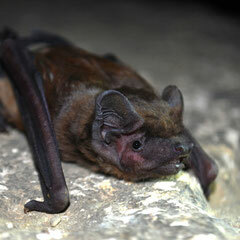 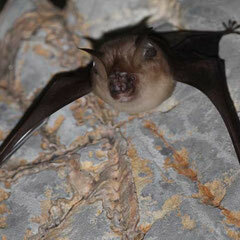 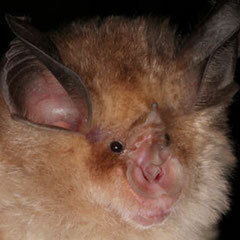 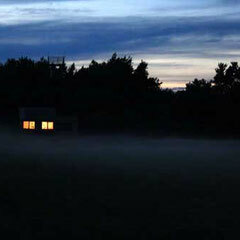 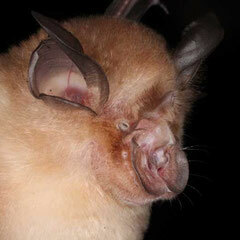 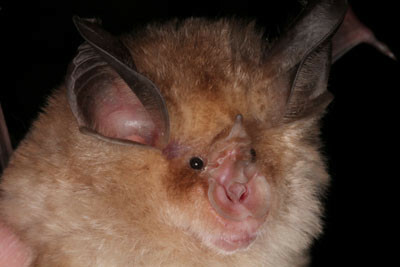 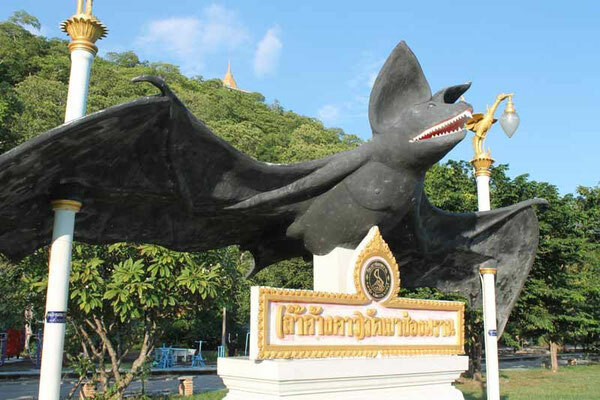 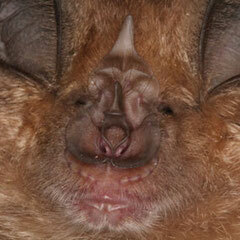 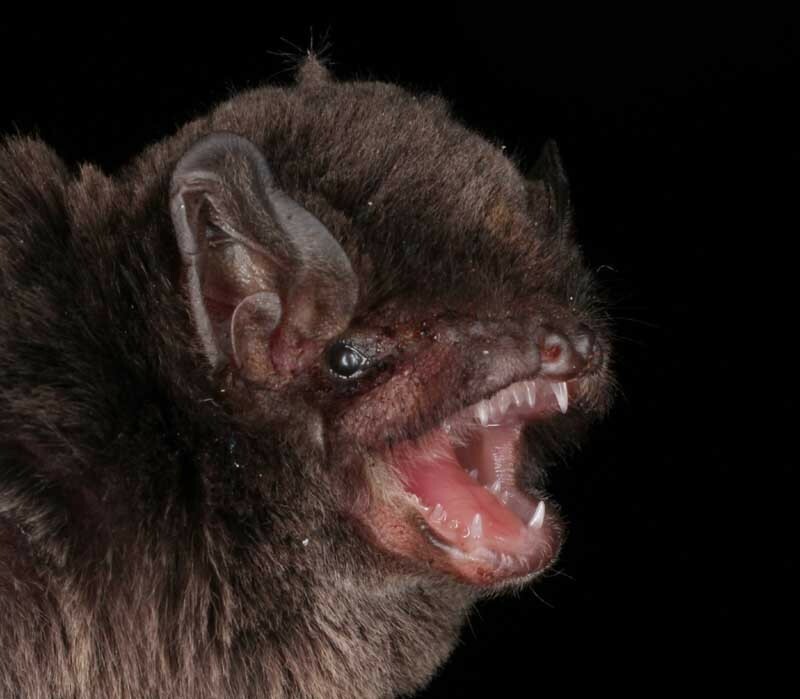 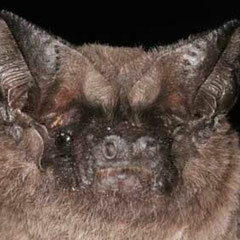 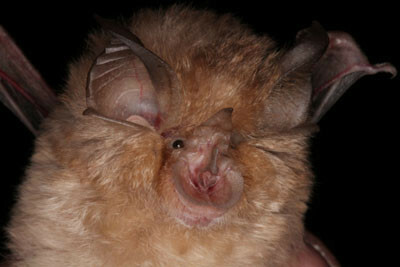 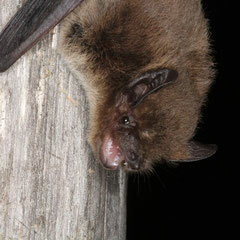 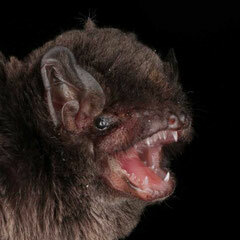 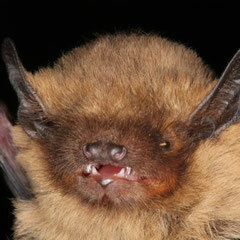 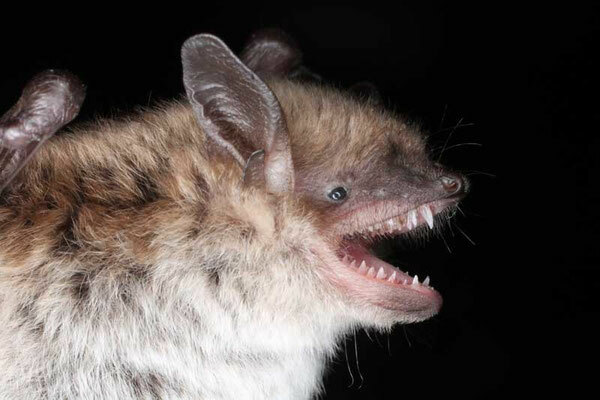 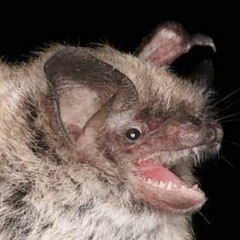 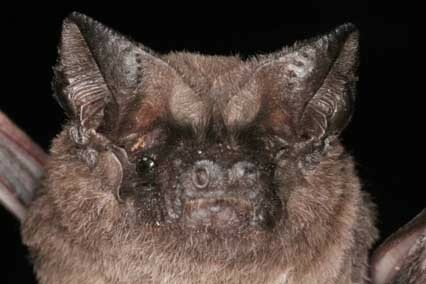 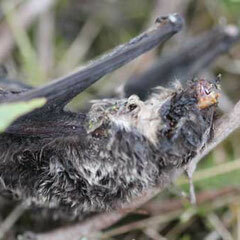 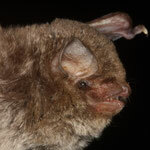 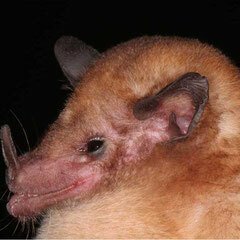 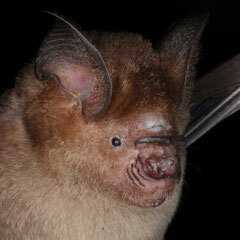 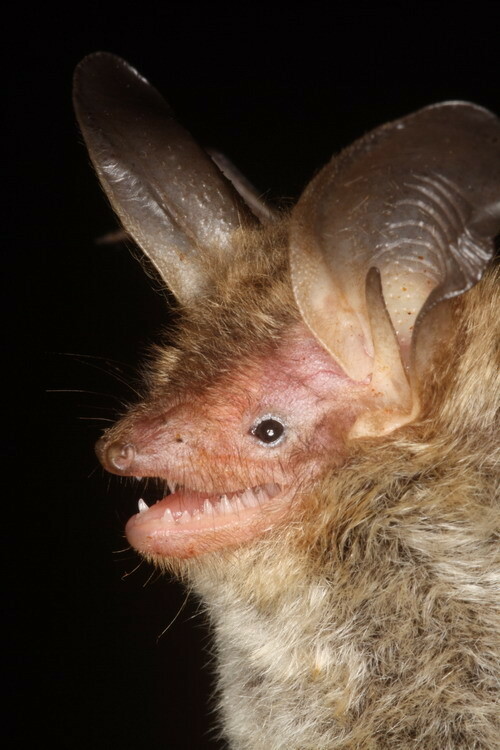 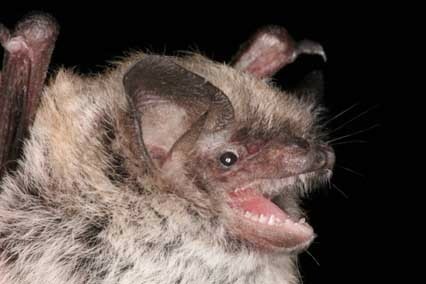 Once in a while, bats arouse from hibernation for a few hours; yet the underlying reason for this behaviour is unknown. 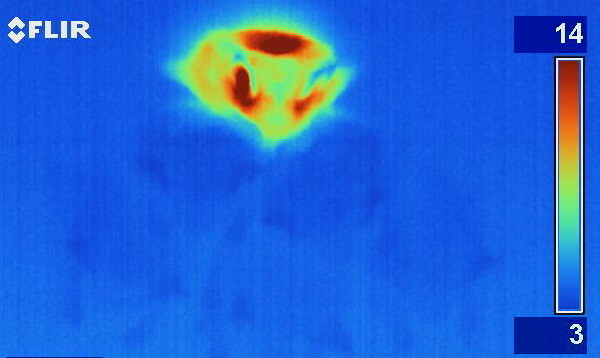 The thermal imaging picture (right) shows an aroused mouse-eared bat (yellow-red body) sitting on top of 5 hibernating conspecifics that have body temperature quite similar to the enviornment (blue colour). 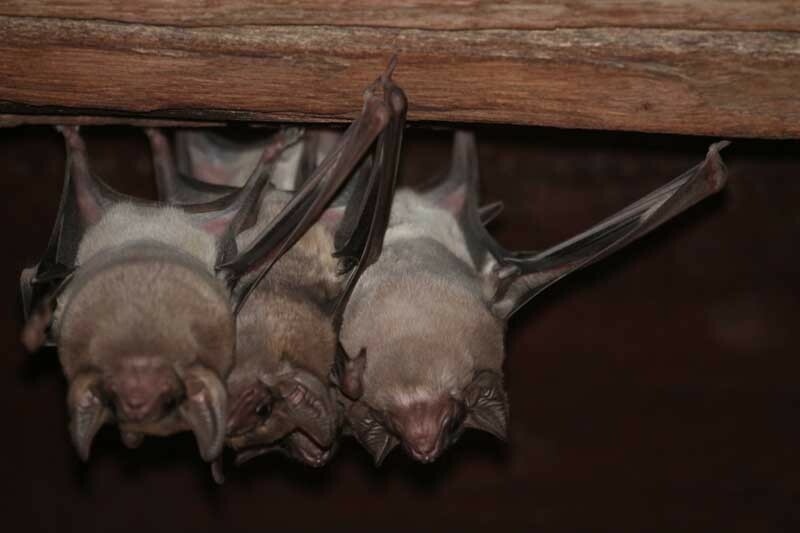 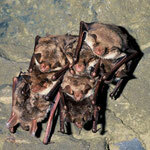 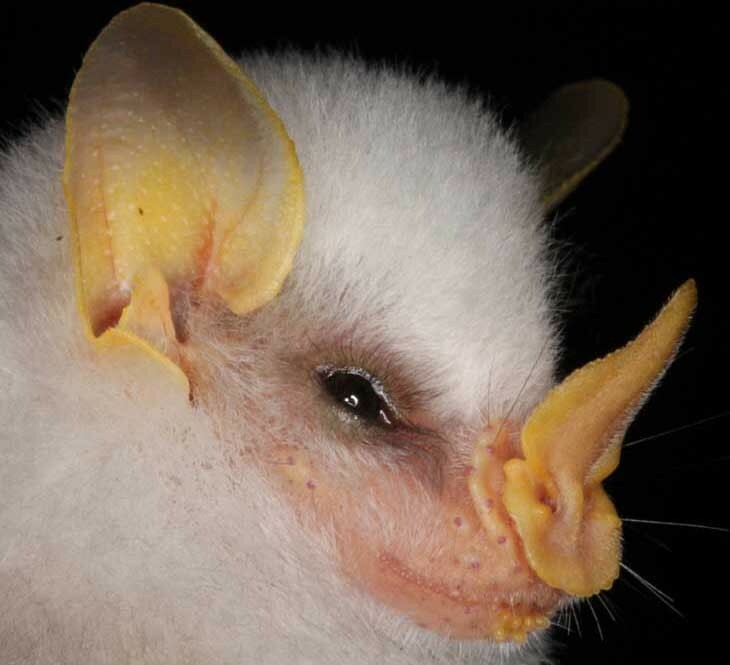 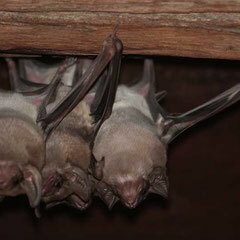 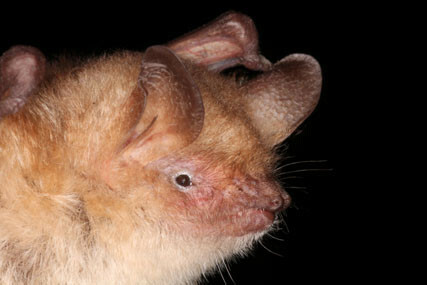 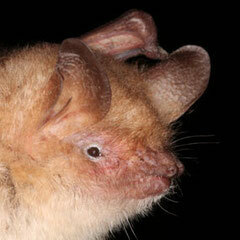 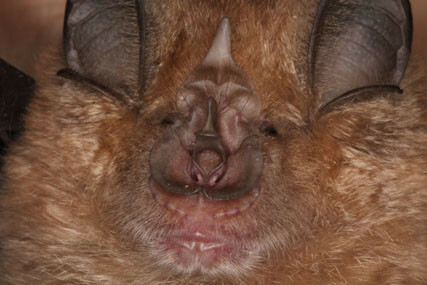 The middle picture shows a normal picture of such a cluster of mouse-eared bats. 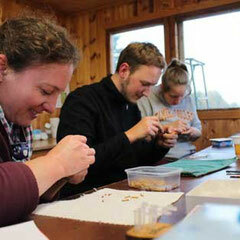 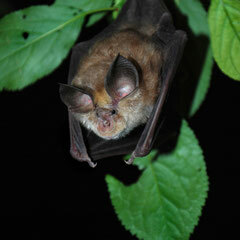 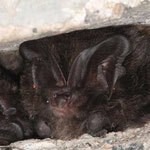 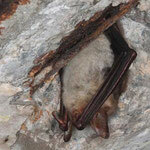 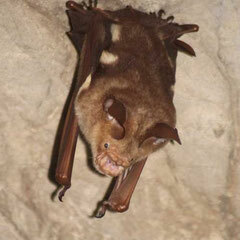 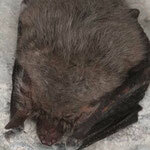 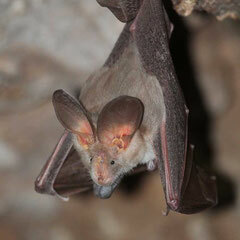 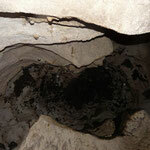 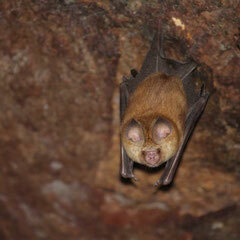 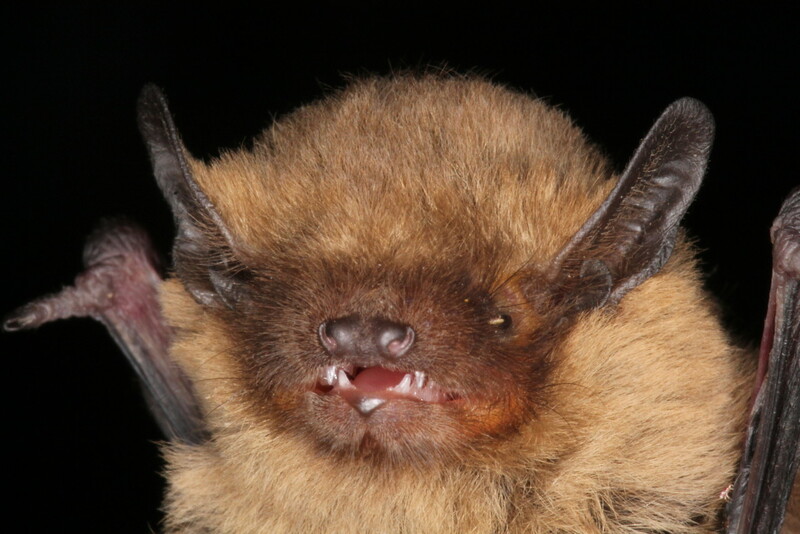 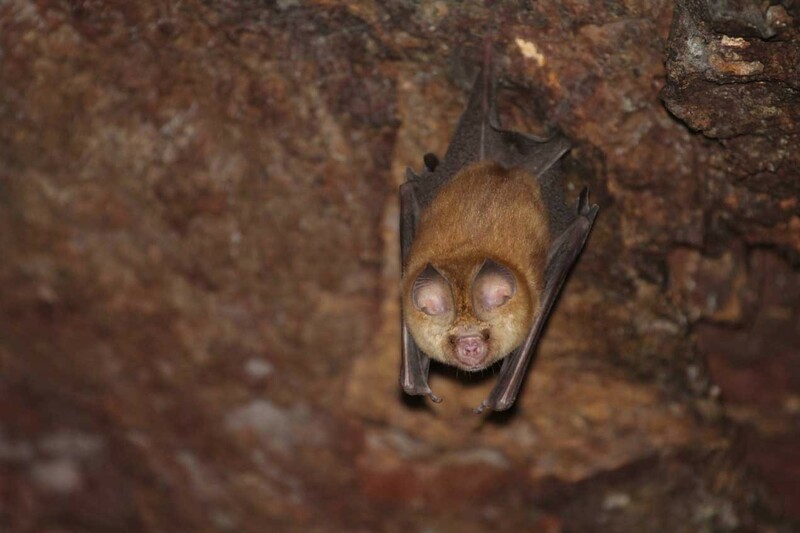 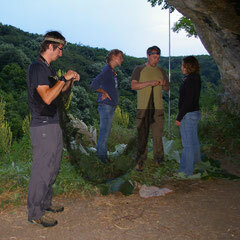 We have been working on the physiology of hibernating bats over the past few years. 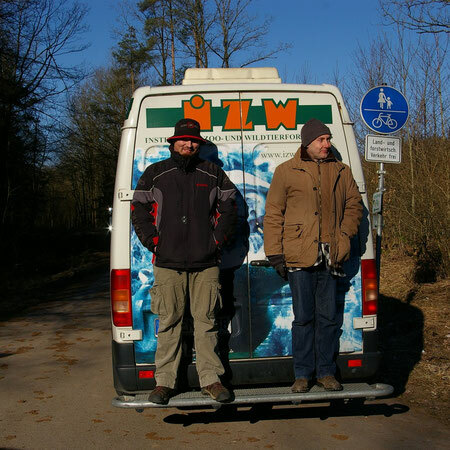 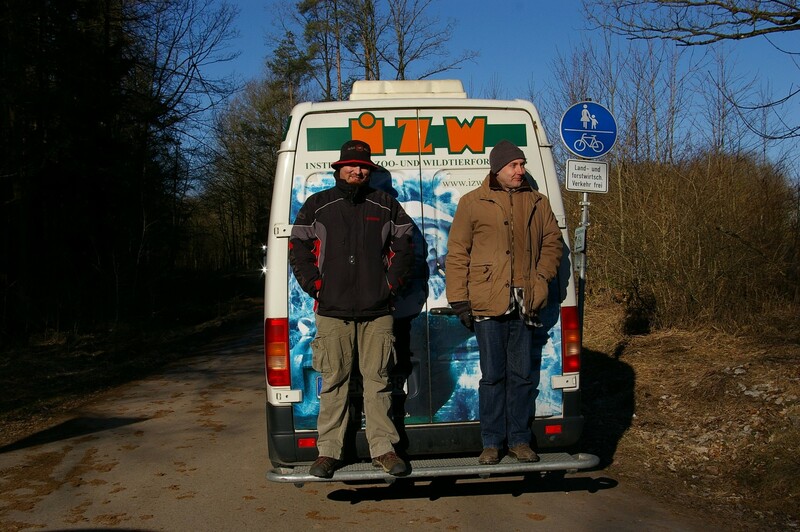 For this purpose, we are using our lab van (left picture) so that we can study, for example, immunological parameters of bats in-situ. 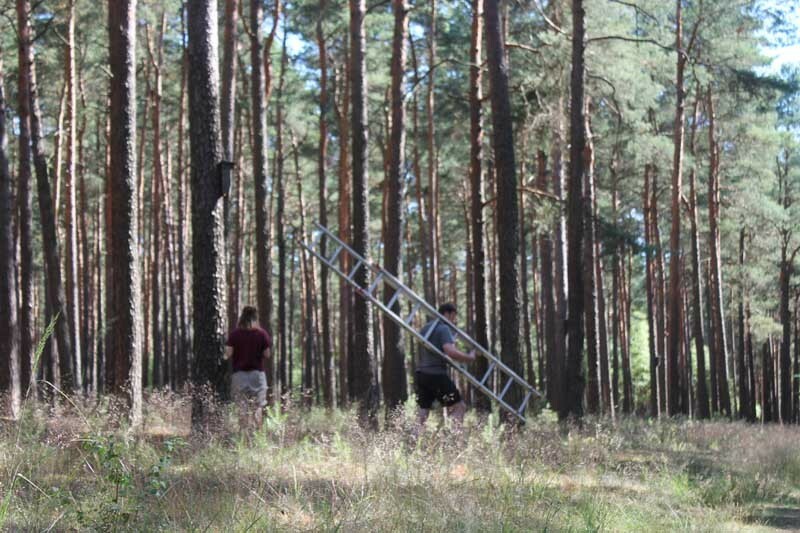 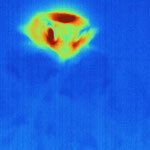 This work is part of a collaboration with Dr. Gabor Czirjak (IZW). 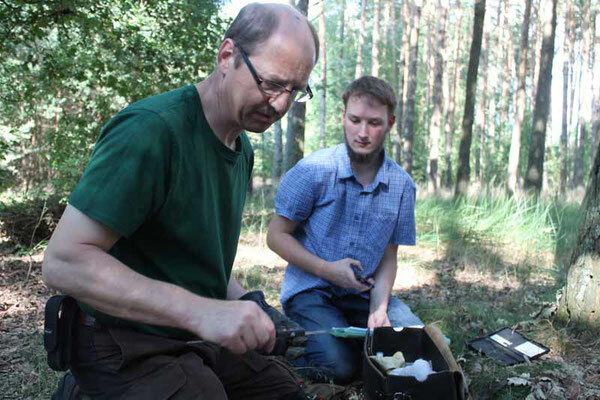 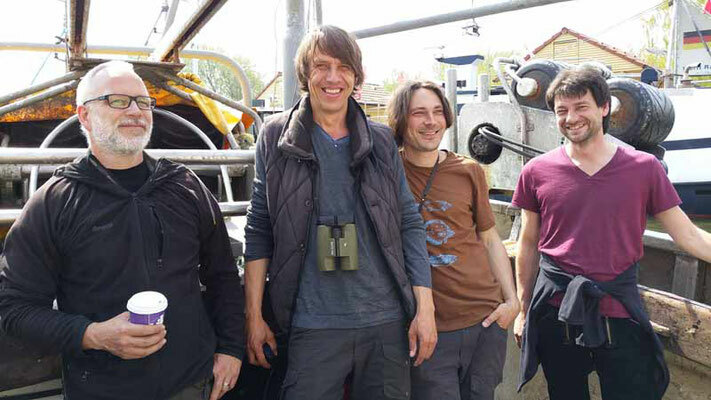 We have been contributing to field work of the Siemers group (PD Dr. Björn Siemers, MPI Ornithology in Seewiesen) in Bulgaria over the past few years. 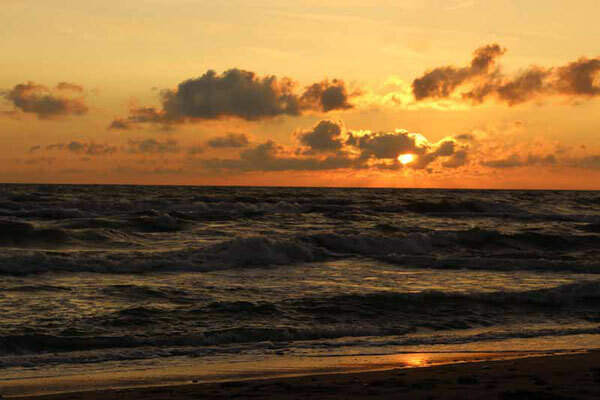 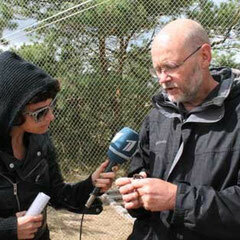 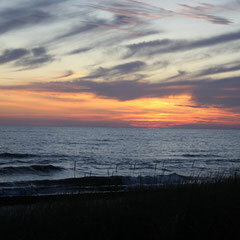 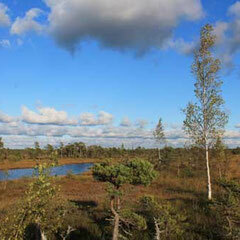 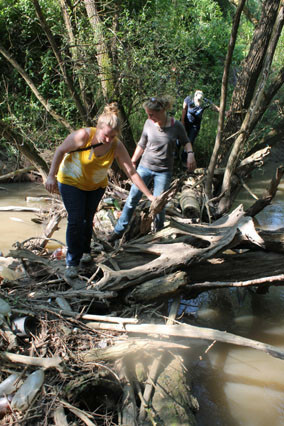 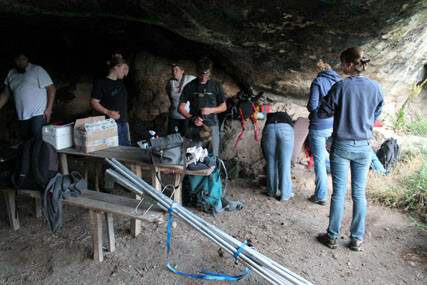 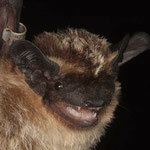 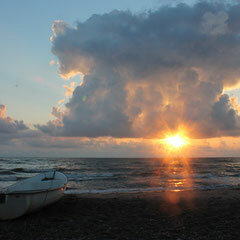 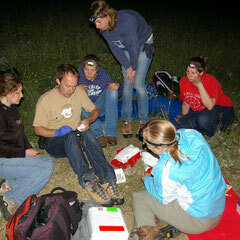 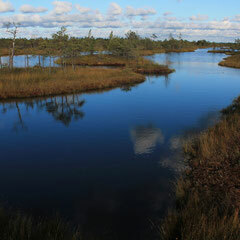 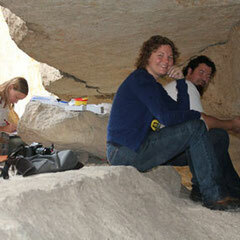 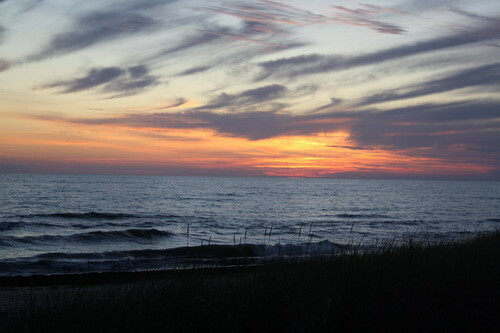 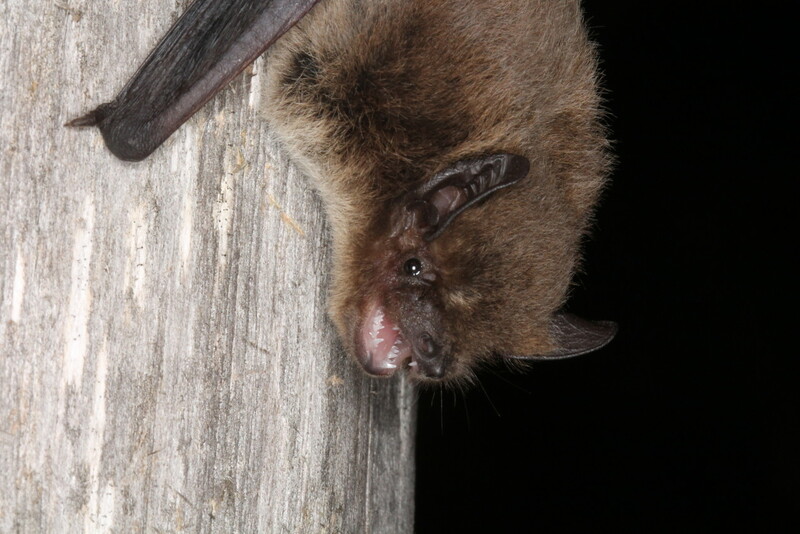 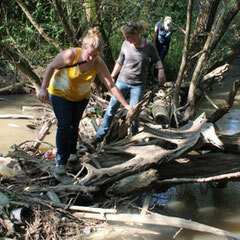 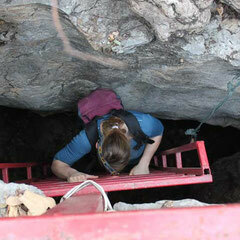 The focus of these field trips was on flight energetics and general physiology and ecology of temperate zone bats. 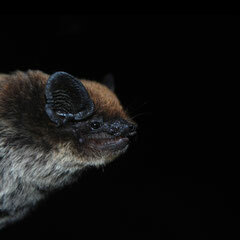 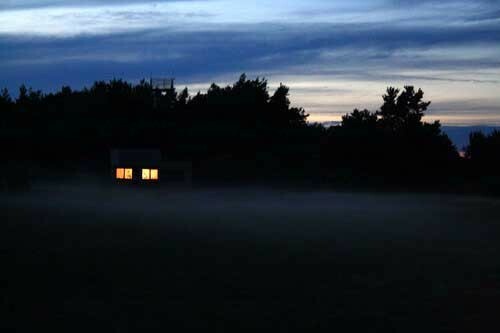 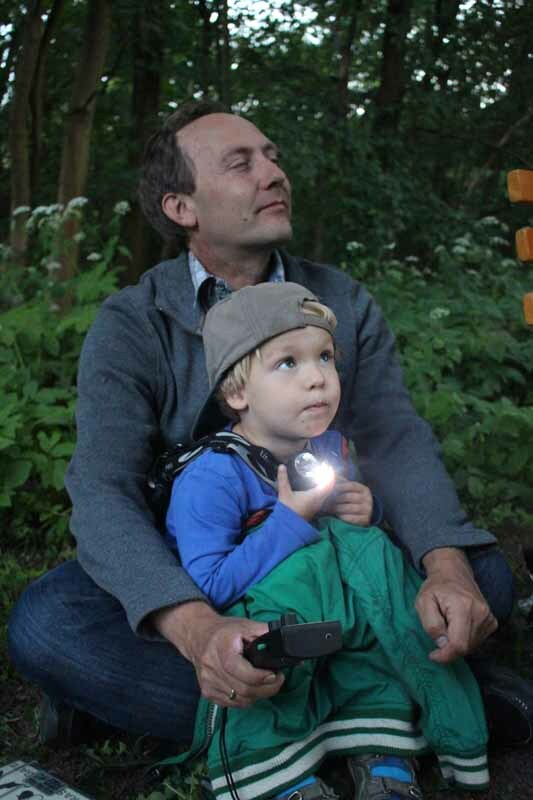 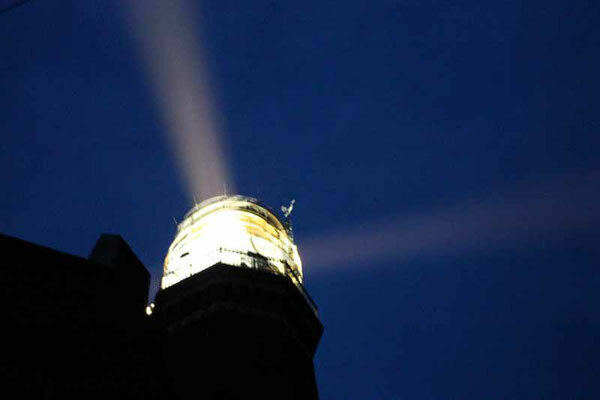 In the field, we quite often capture bats in mistnets. 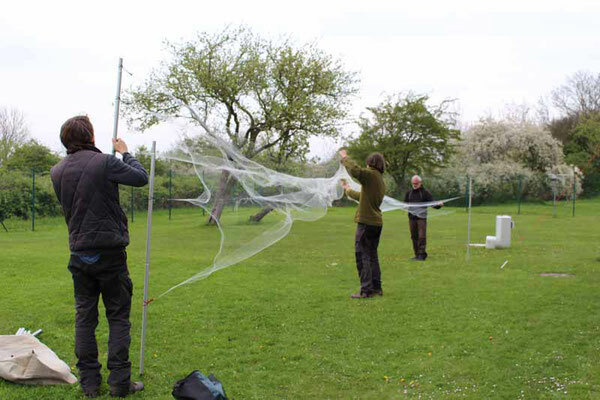 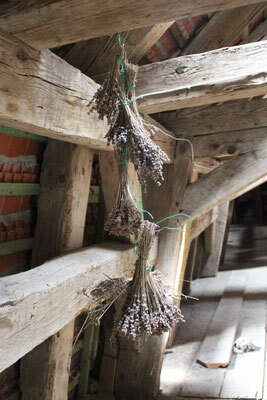 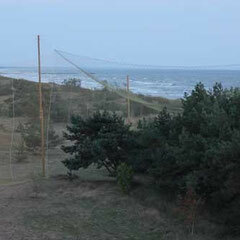 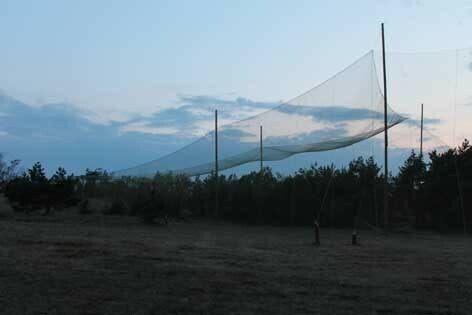 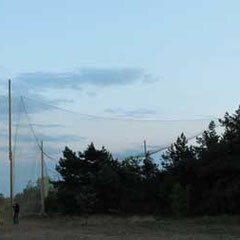 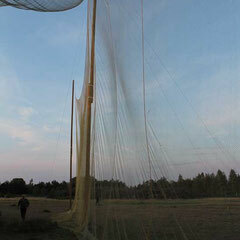 These are very fine nets that bats sometimes miss with their echolocation. 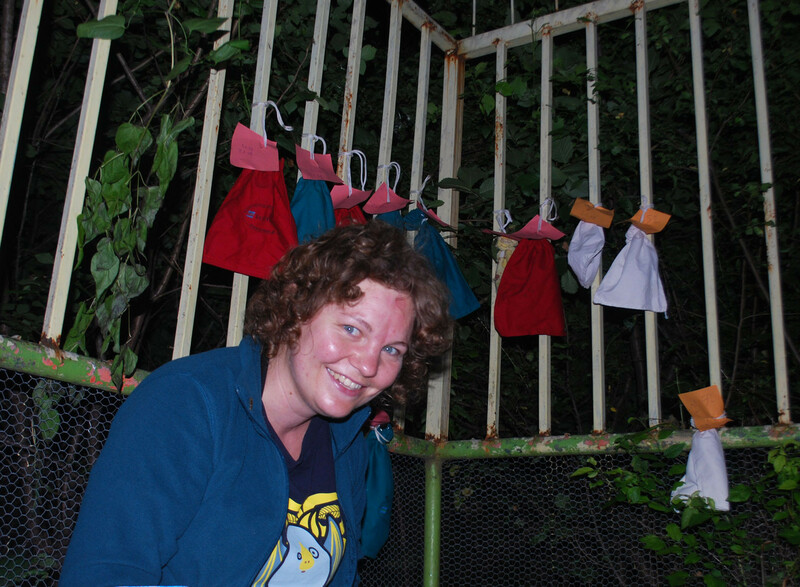 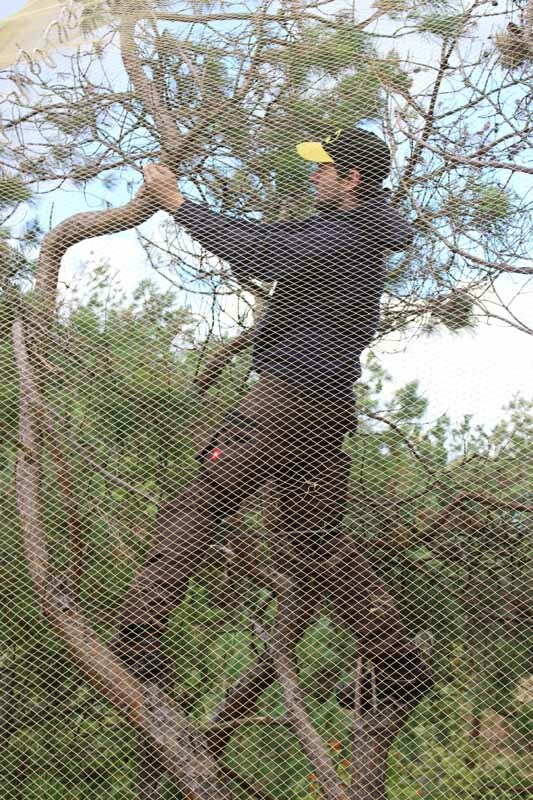 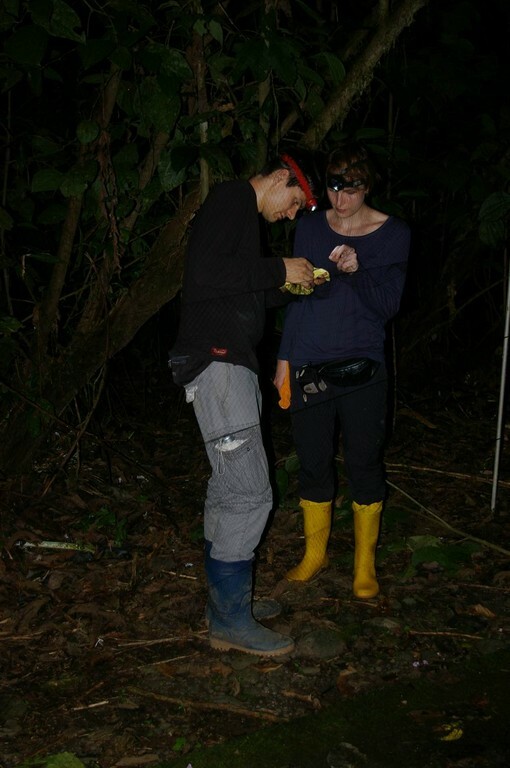 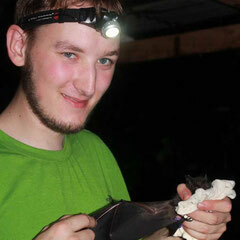 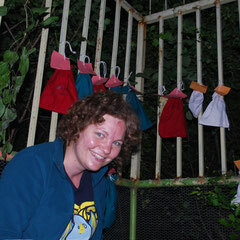 Usually, we identify the species and take body measurements before releasing bats where they have been captured.